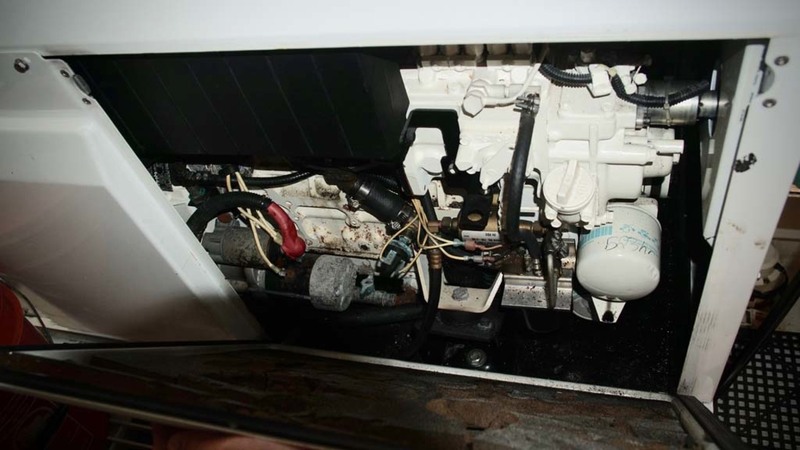 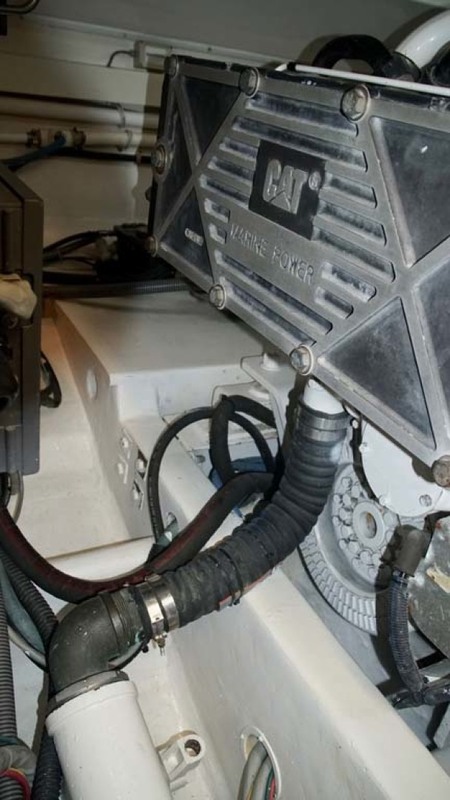 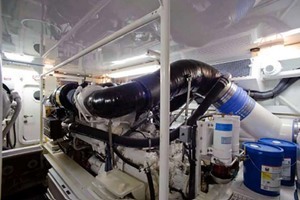 This is the only Cat powered 65 Viking on the market and also the lowest engine hours on any 65 on the market. 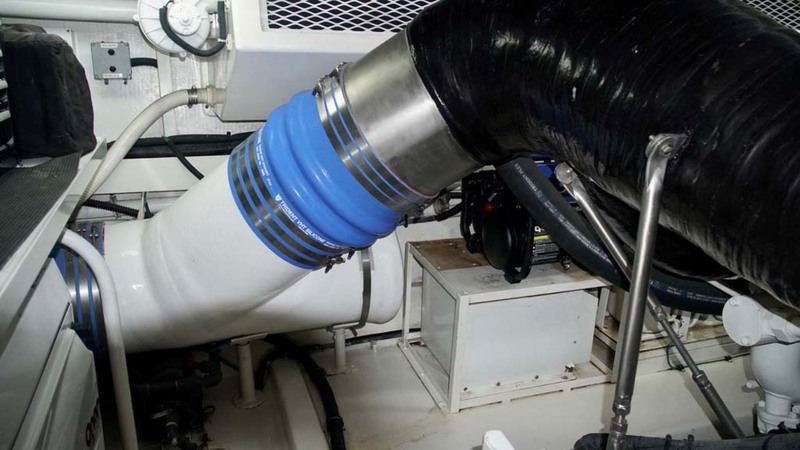 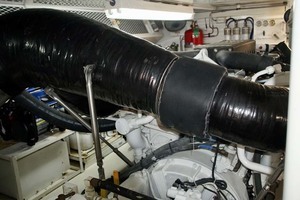 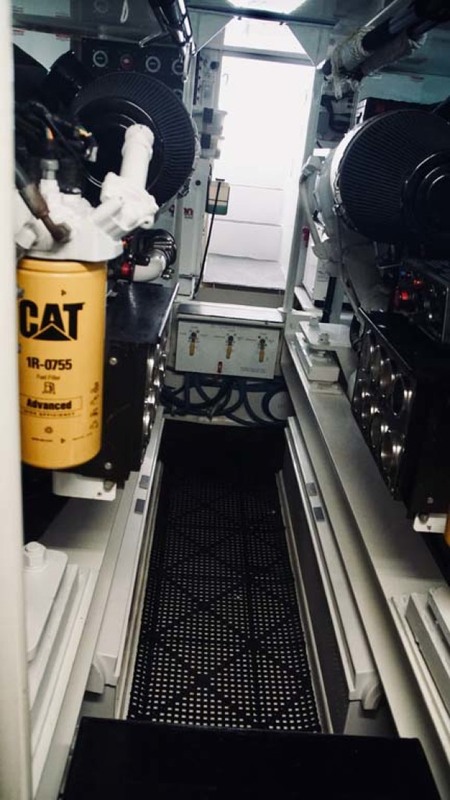 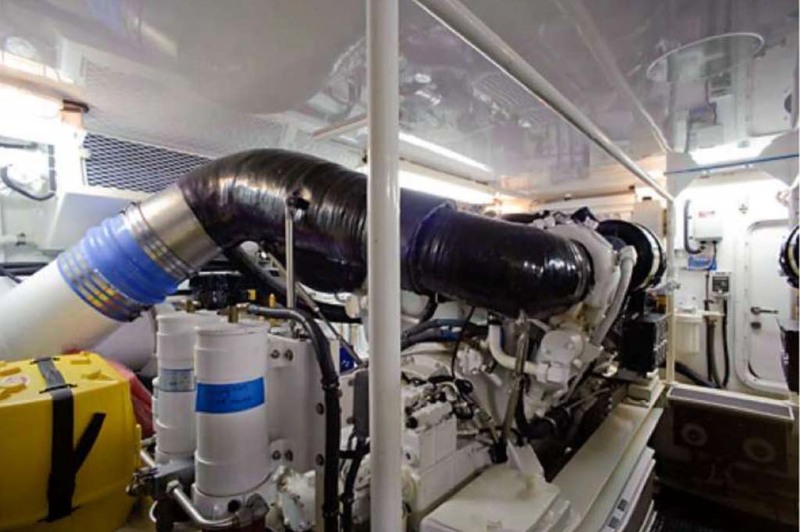 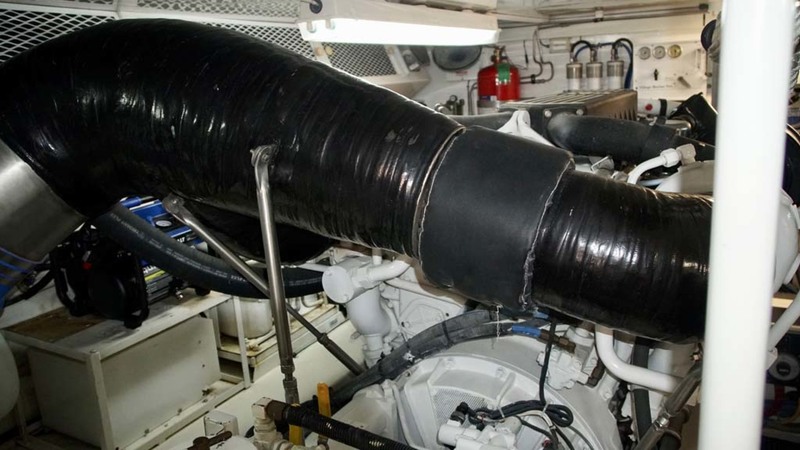 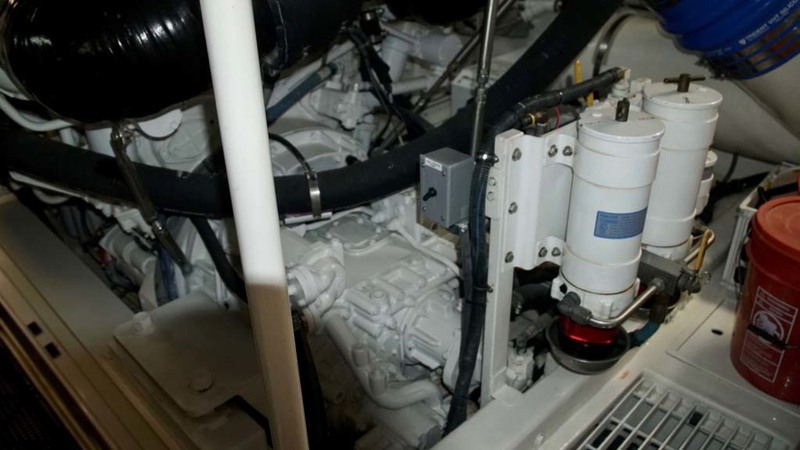 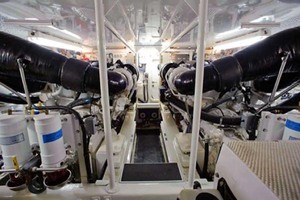 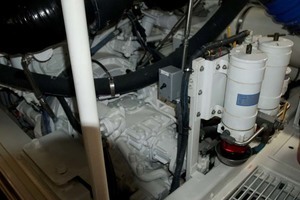 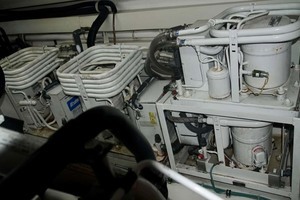 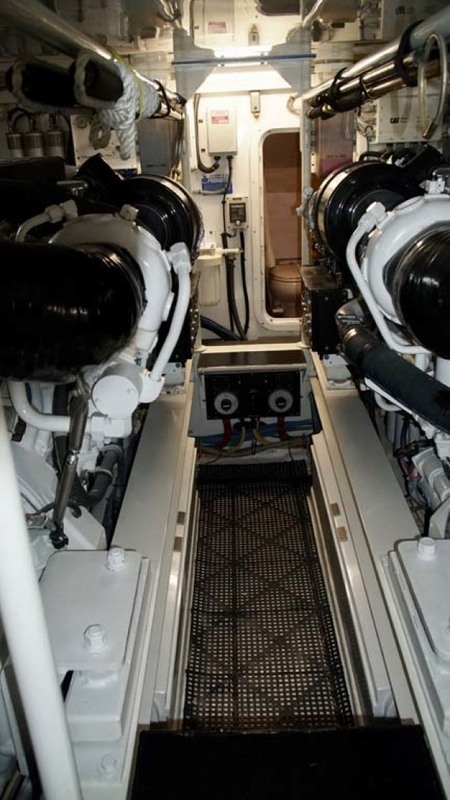 New Caterpillar C-32 A-CERT 1800 HP mains and dual Onan generators were installed in 2008 and still have very low hours. 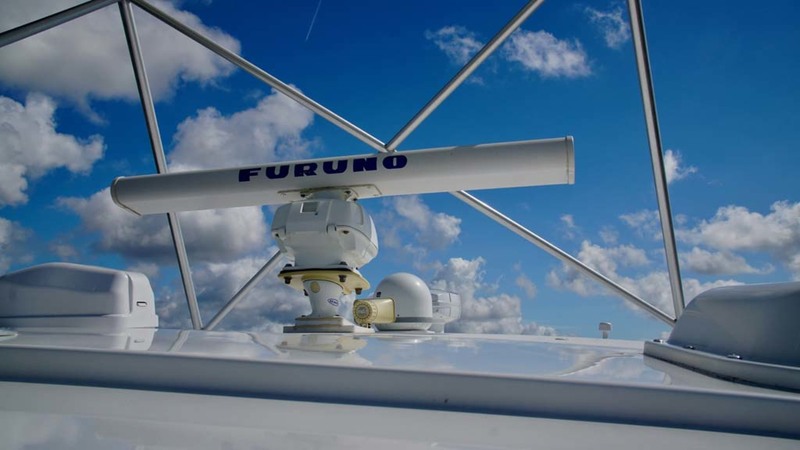 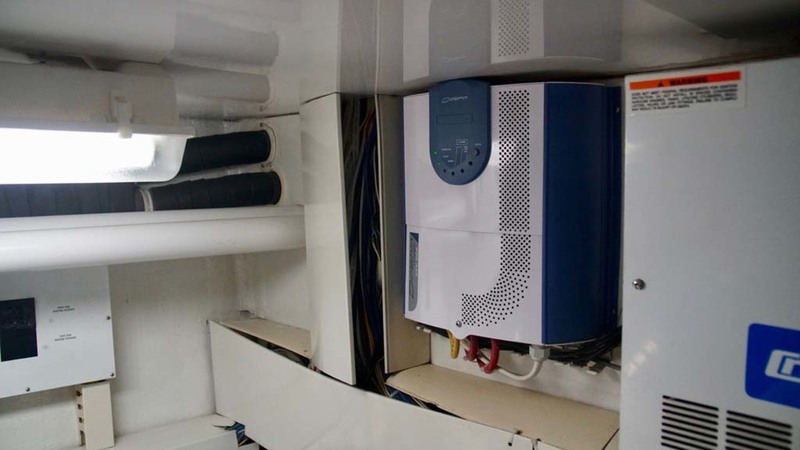 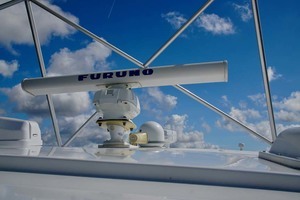 A complete electronics re-fit was completed in 2013 with the installation of all the latest and greatest from Furuno. 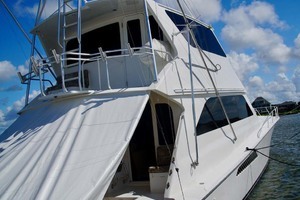 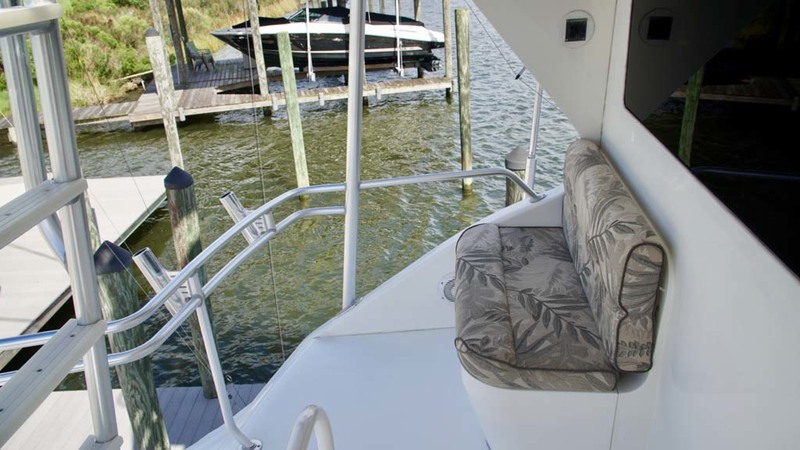 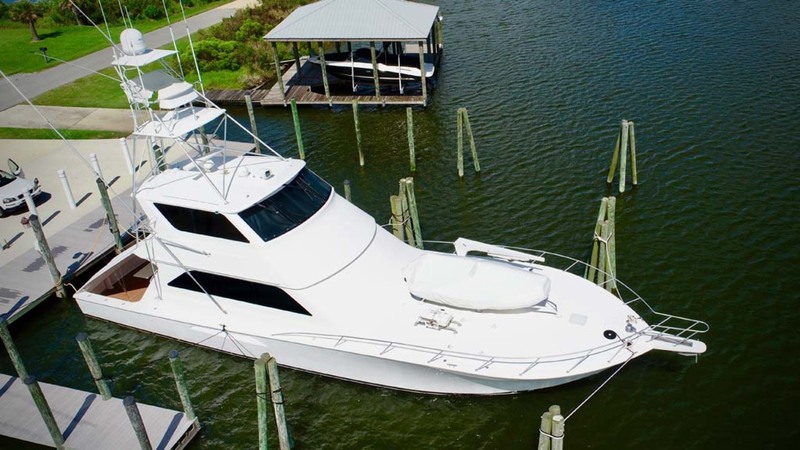 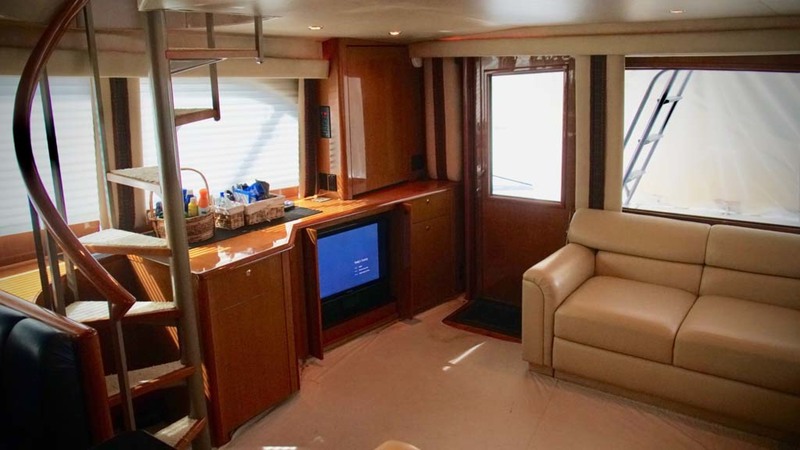 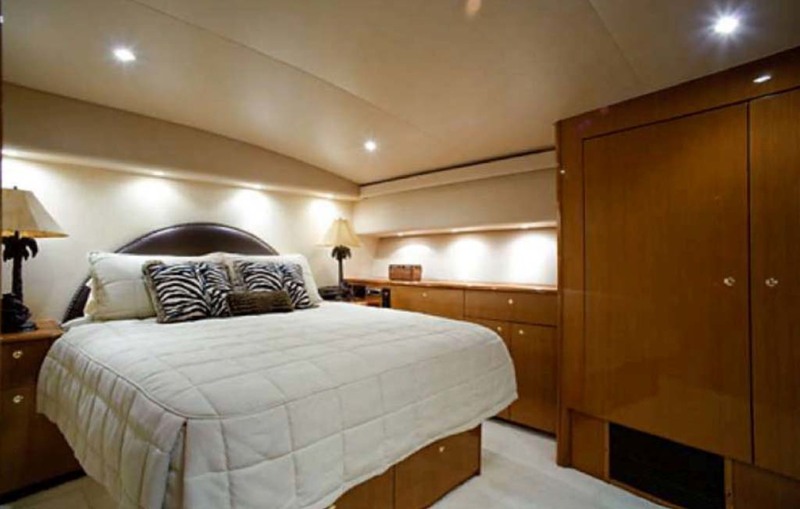 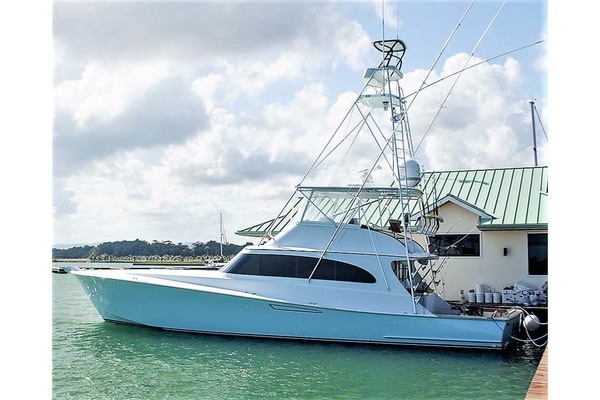 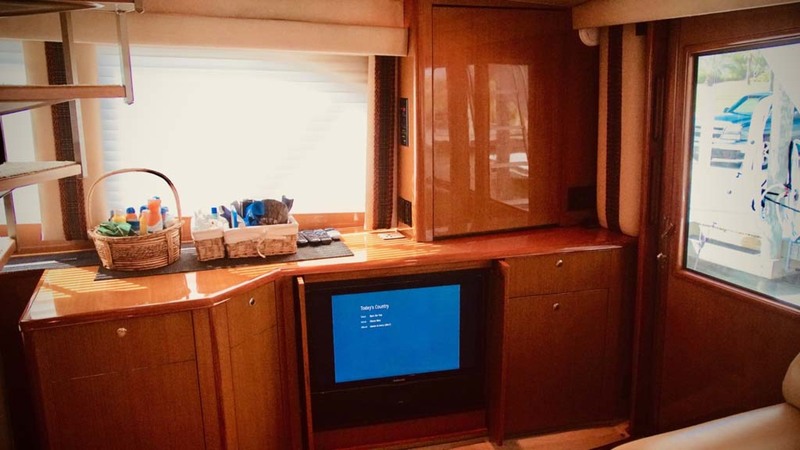 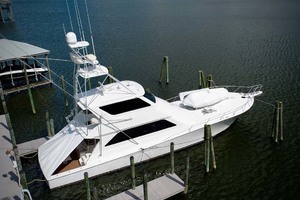 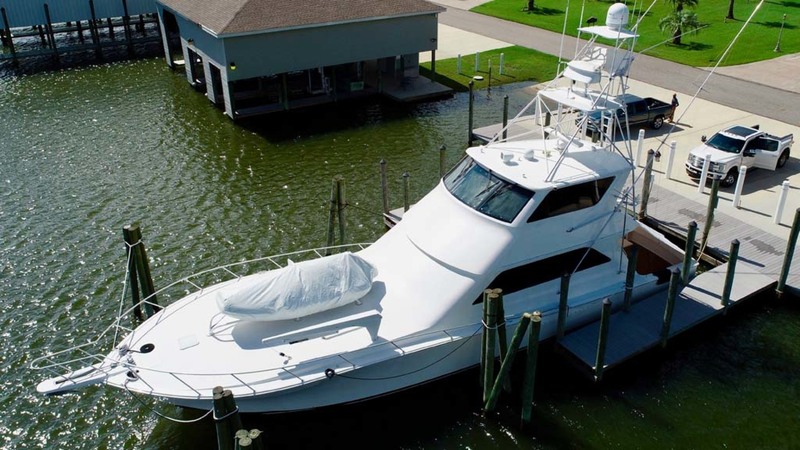 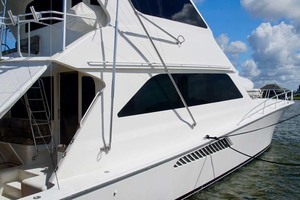 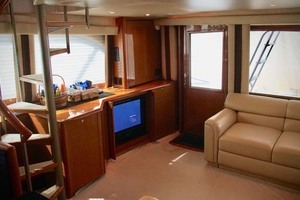 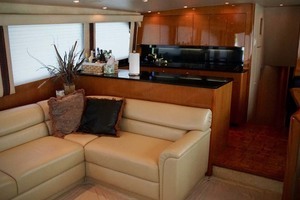 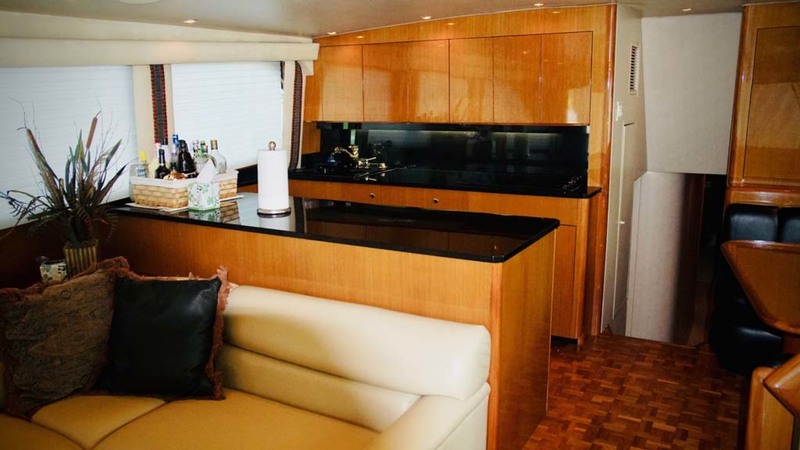 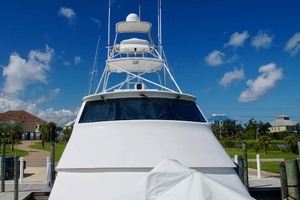 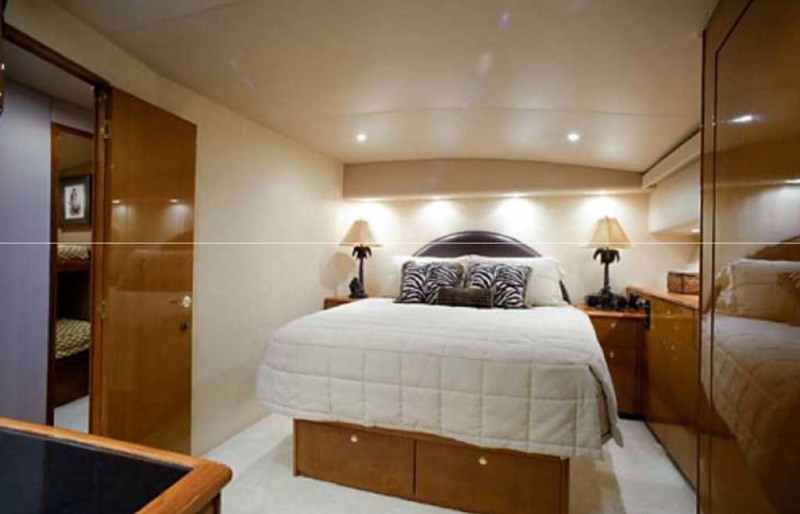 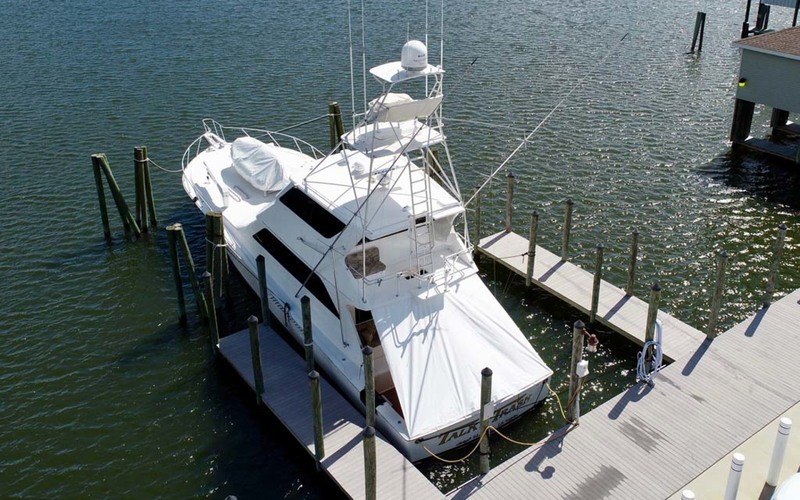 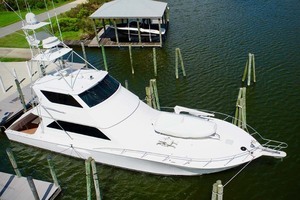 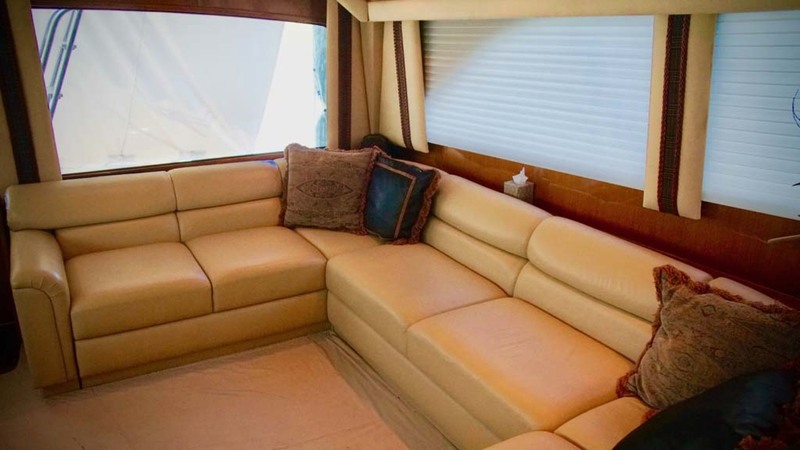 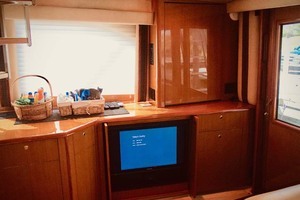 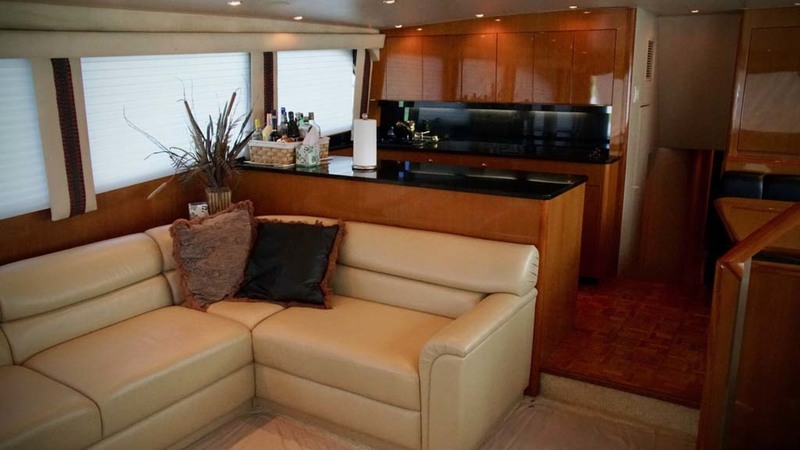 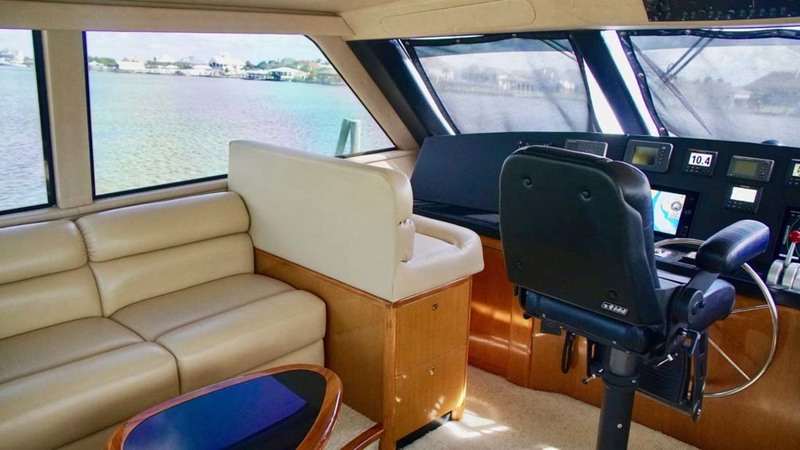 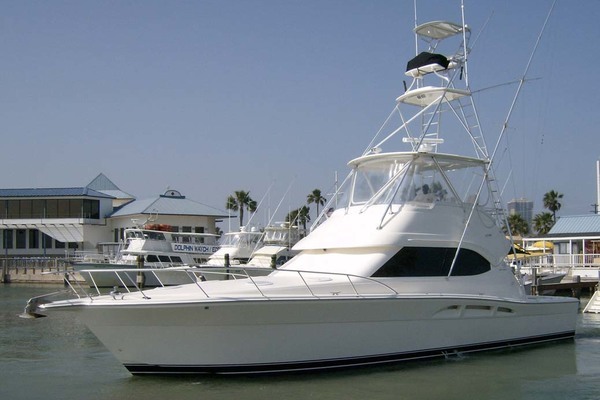 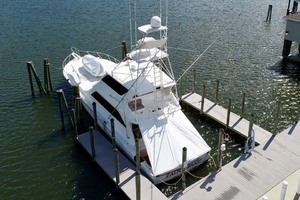 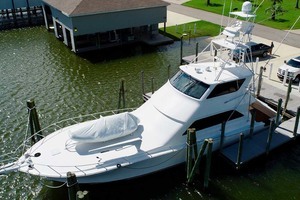 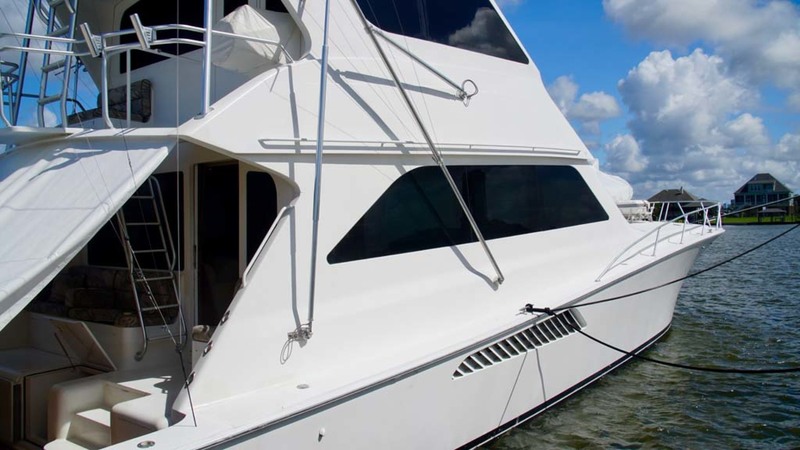 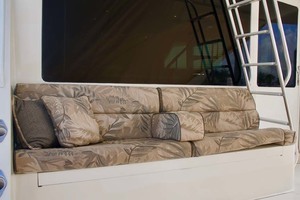 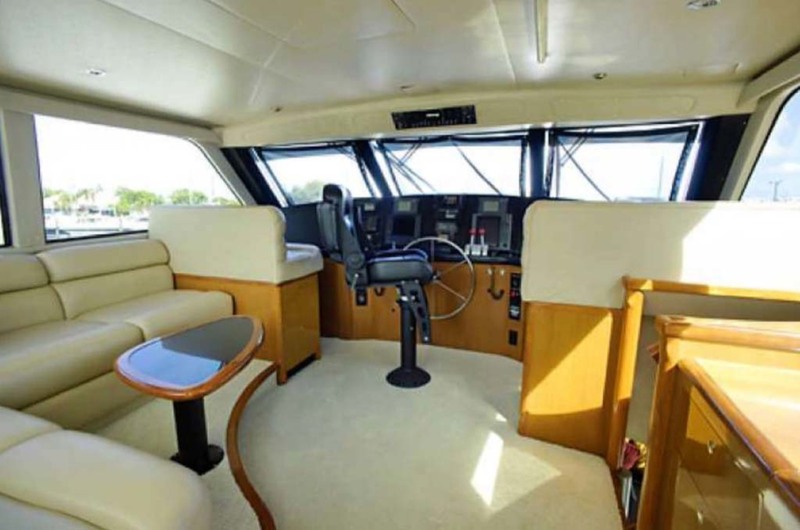 This 2001 65' Viking Convertible is nothing short of extraordinary and offers the optimum four stateroom arrangement. The interior decor scheme is as rich and beautiful as they come. 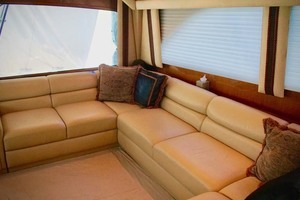 From custom granite countertops, to the custom wall covering and baby ostrich headliner throughout. 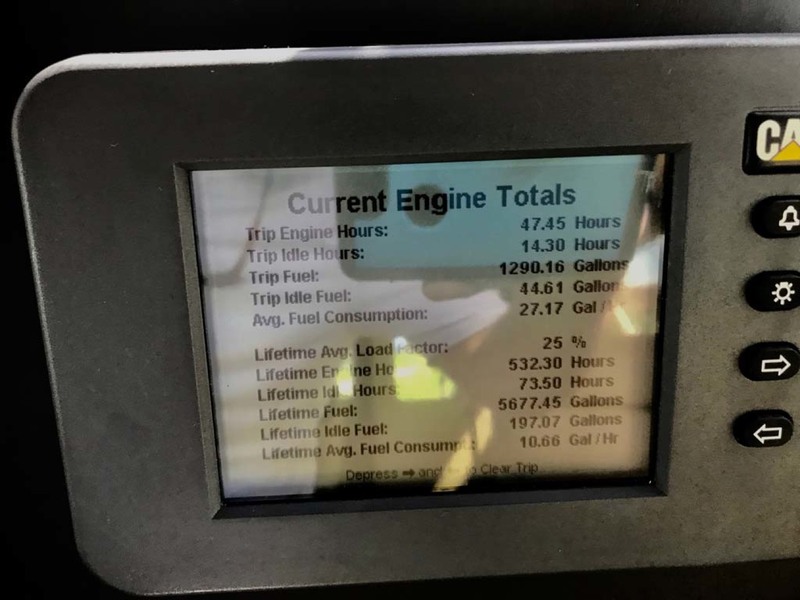 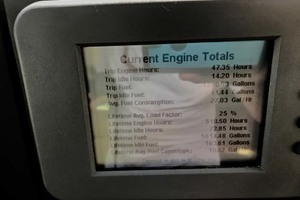 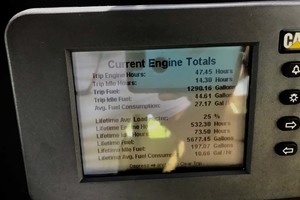 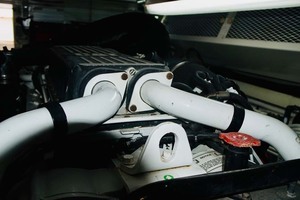 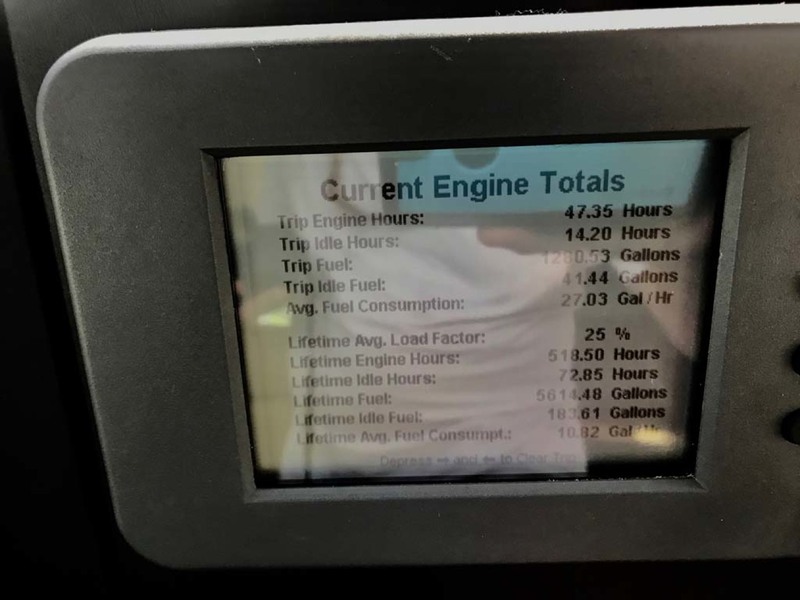 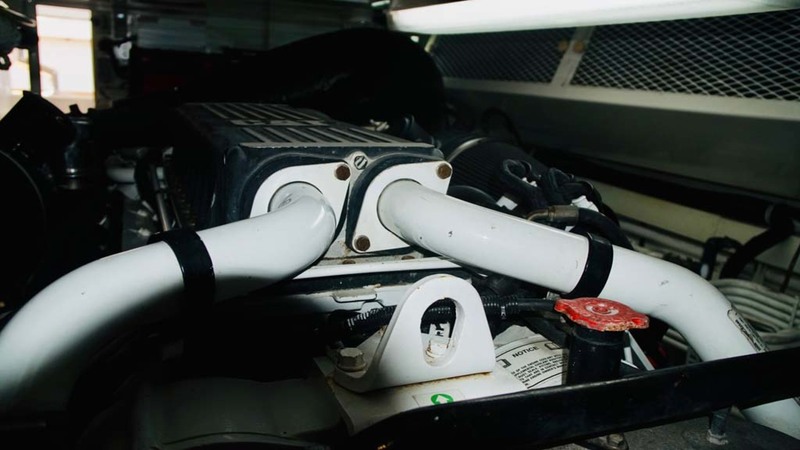 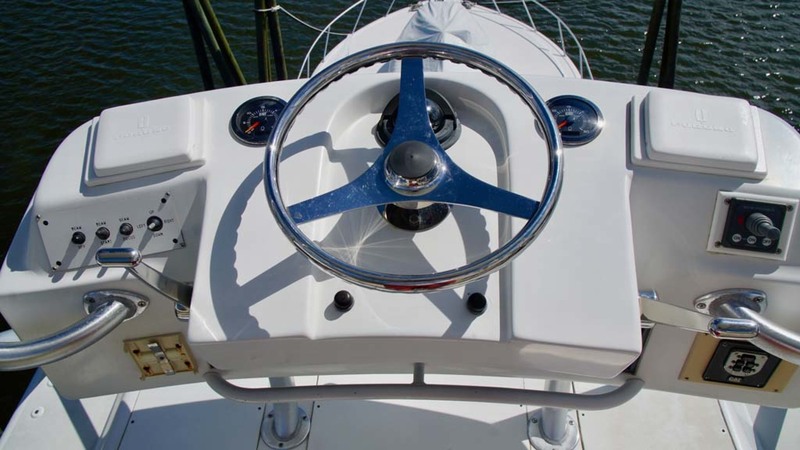 The specs will show that this 65 includes every custom option available and then some, no expense was spared, during the construction and aftermarket additions. 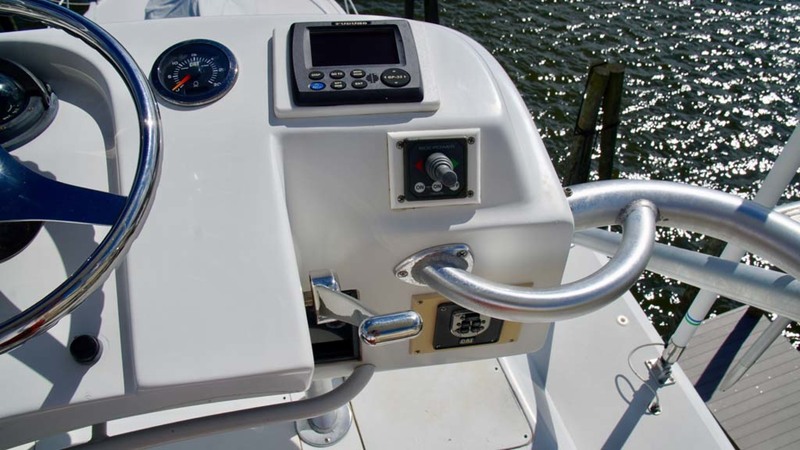 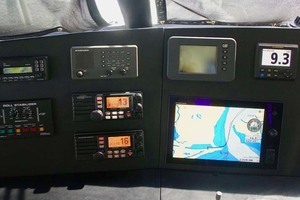 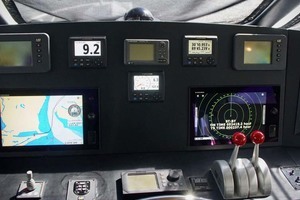 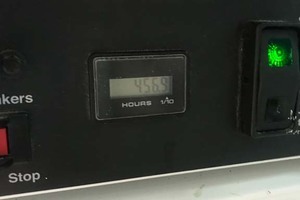 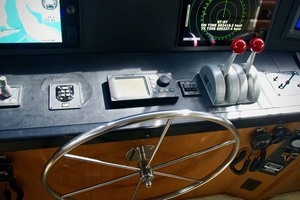 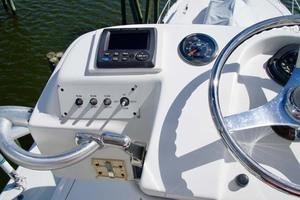 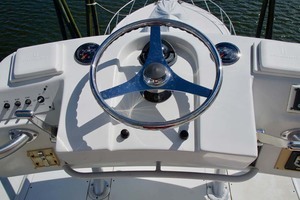 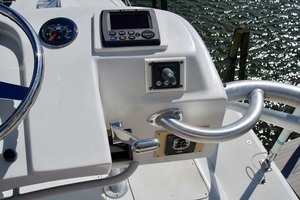 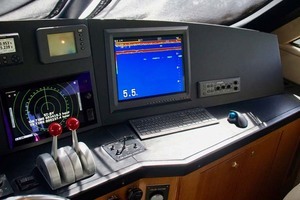 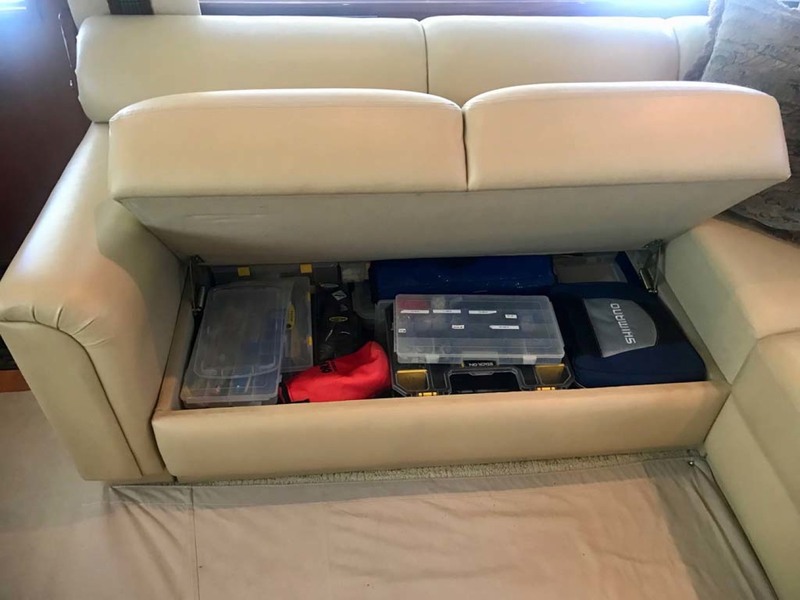 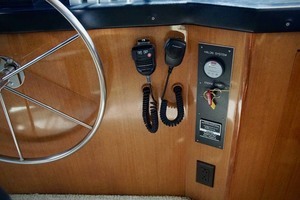 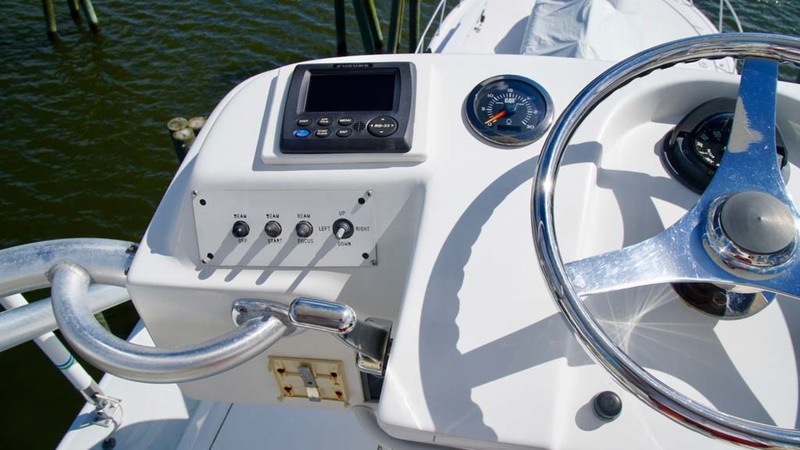 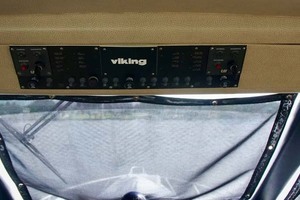 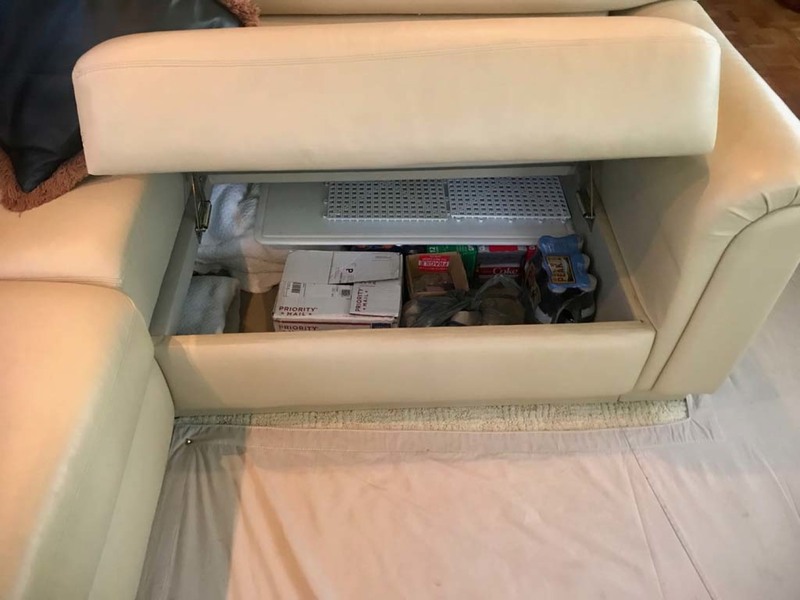 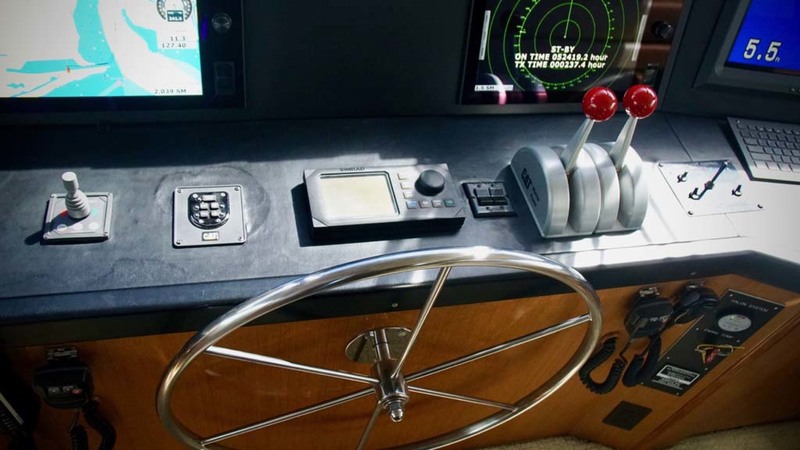 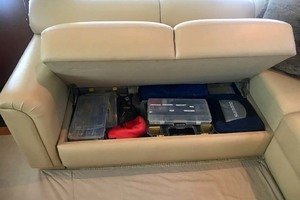 The electronics package perfectly fills the 65' Viking's huge helm dash. 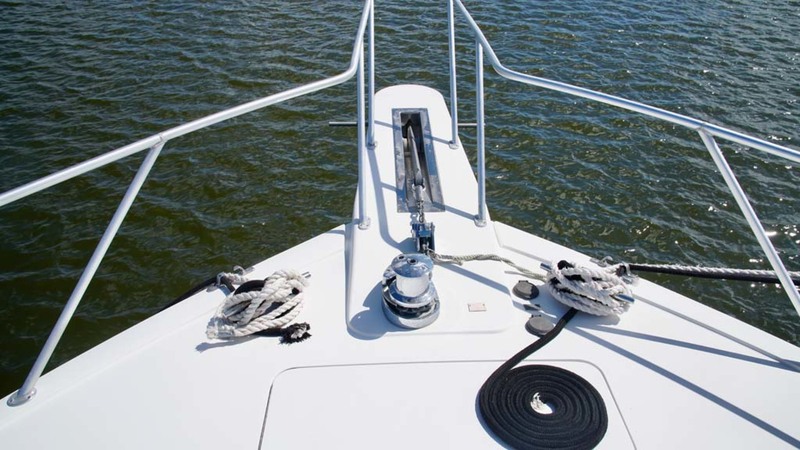 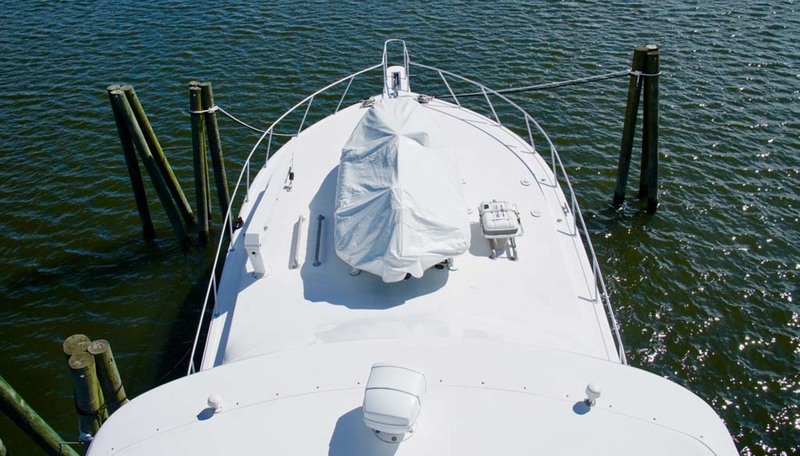 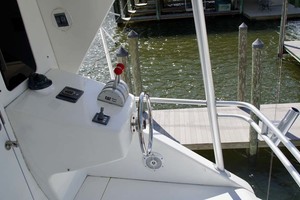 The tower is rigged and ready, and the bow davit lets you take your toys! 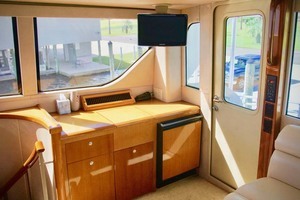 Everything is completely dialed in, turnkey and ready to travel and fish. 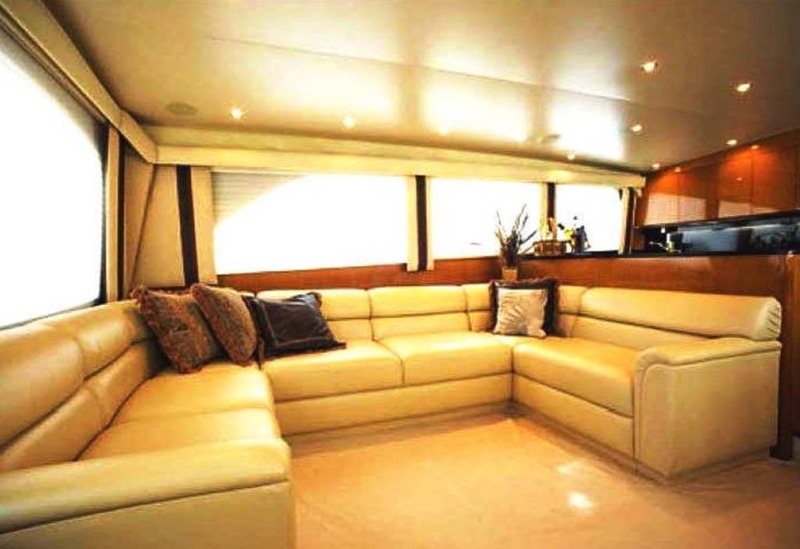 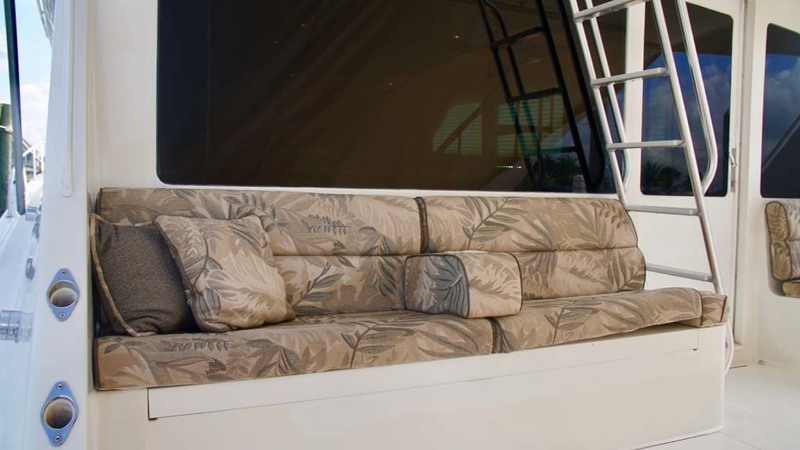 As you enter the salon, the U-Shaped salon sofa is to port, with main electric panel, credenza storage and entertainment center to starboard. 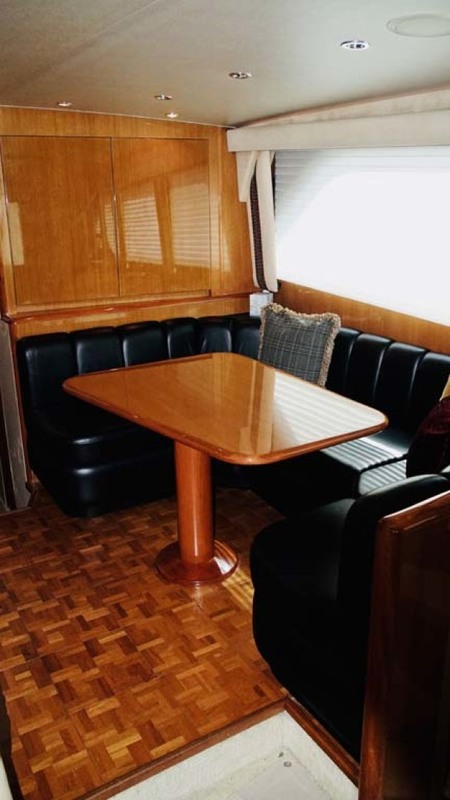 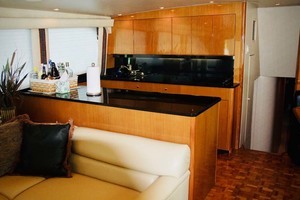 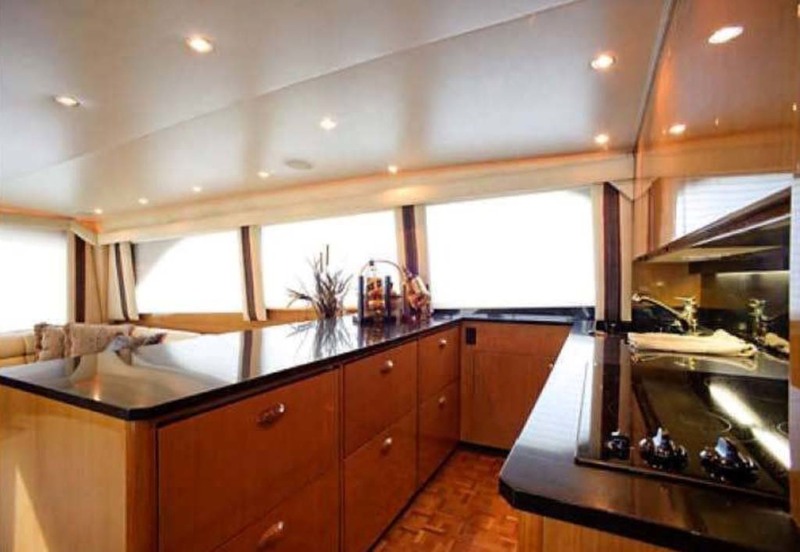 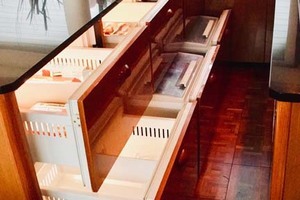 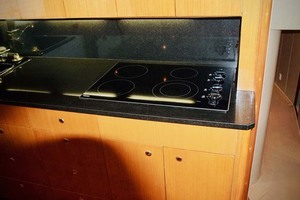 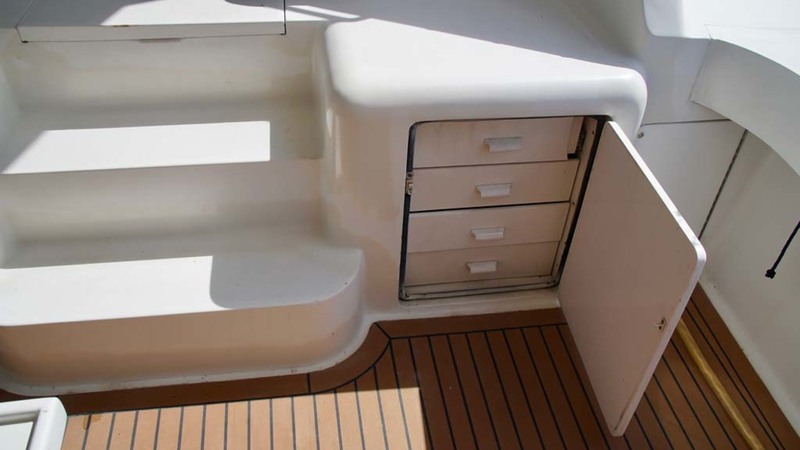 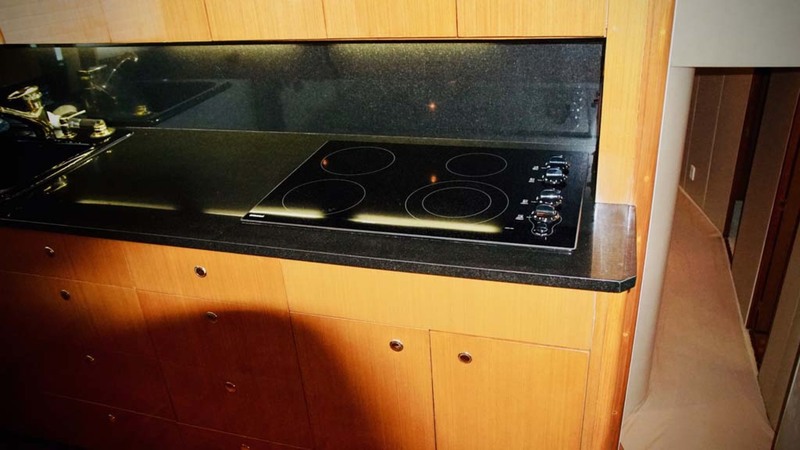 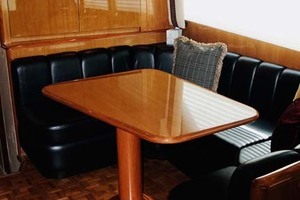 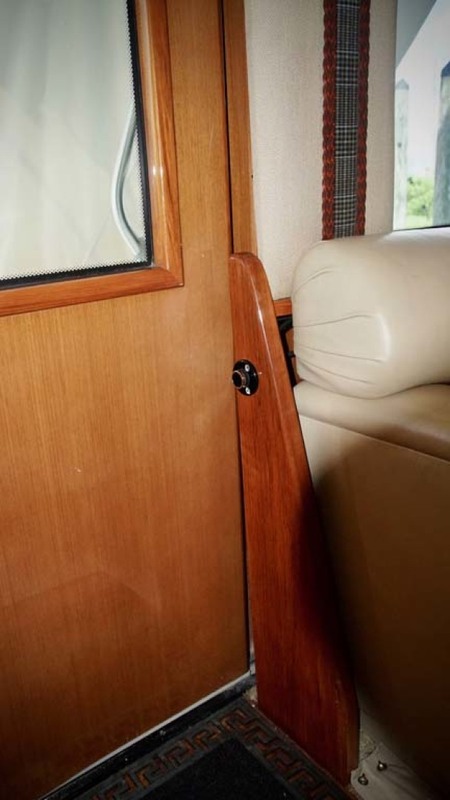 Moving forward is the teak parquet floored galley and dinette arrangement. 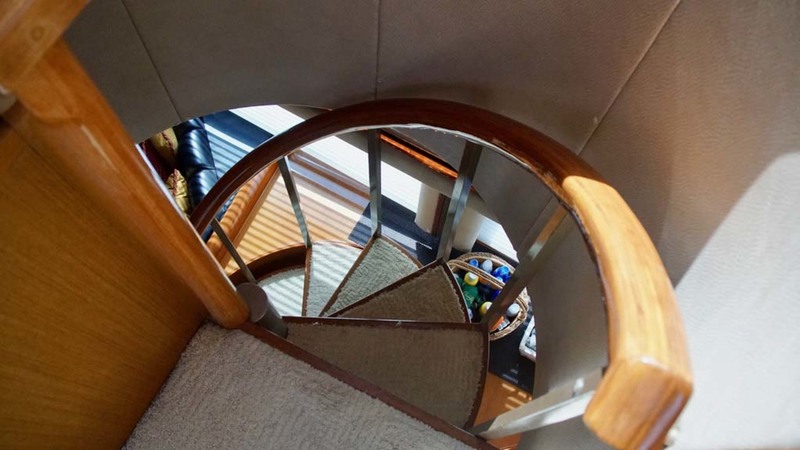 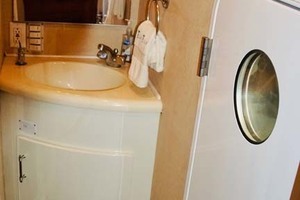 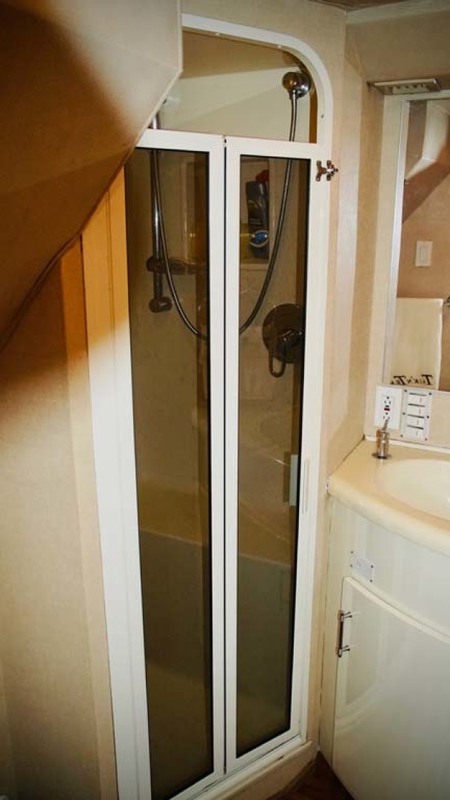 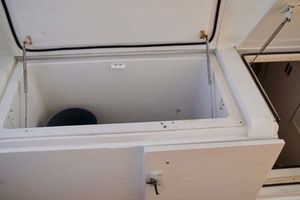 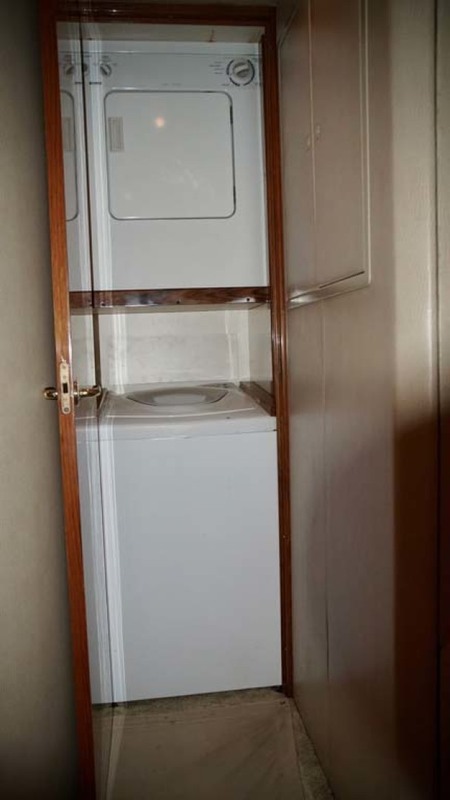 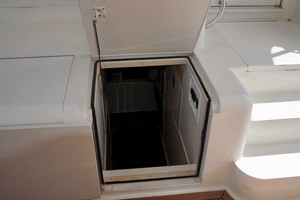 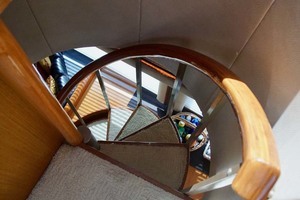 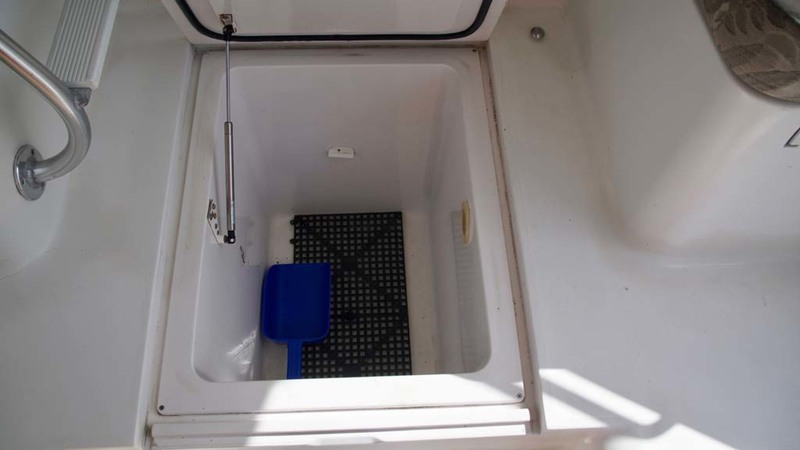 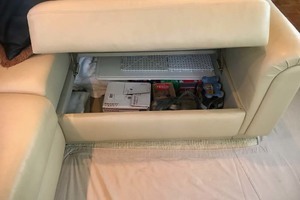 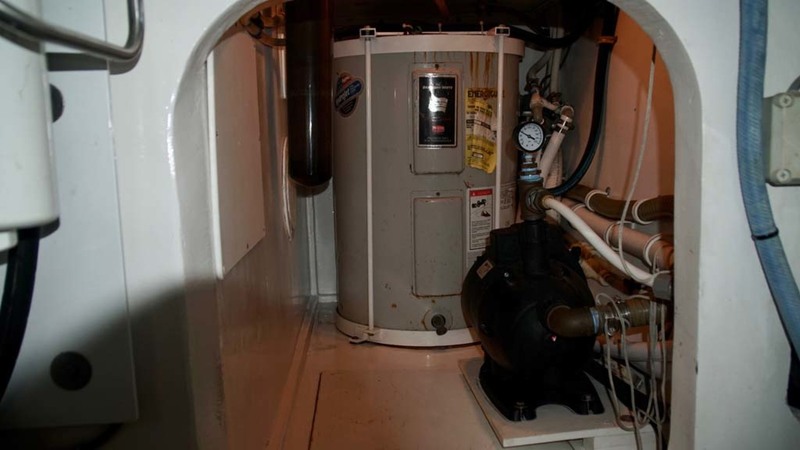 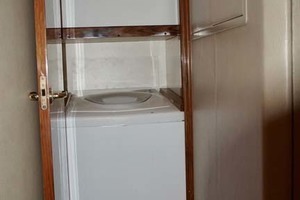 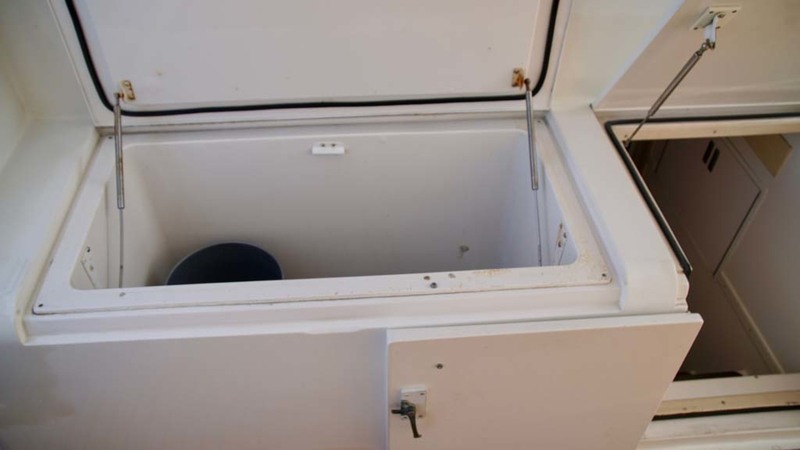 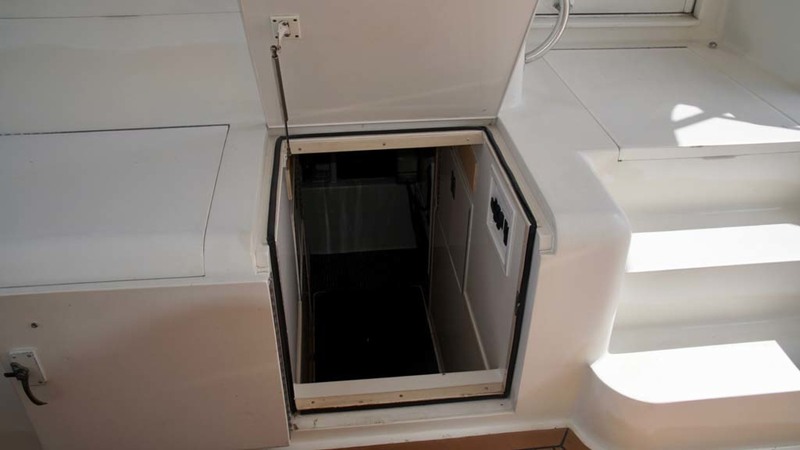 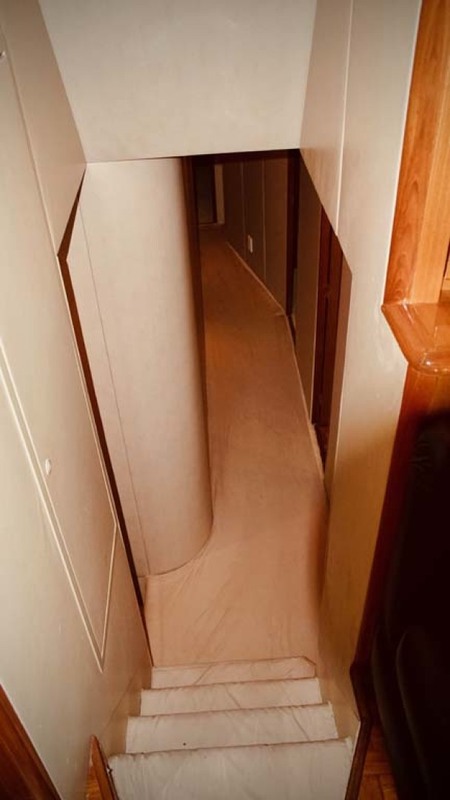 Walking down the companionway steps you will find a stacked washer/dryer behind a cabin door to starboard with storage aft. 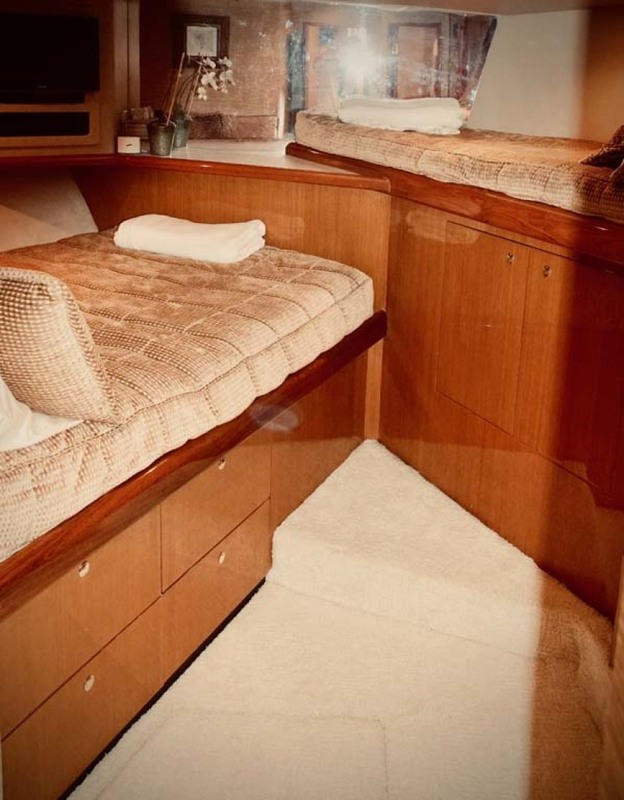 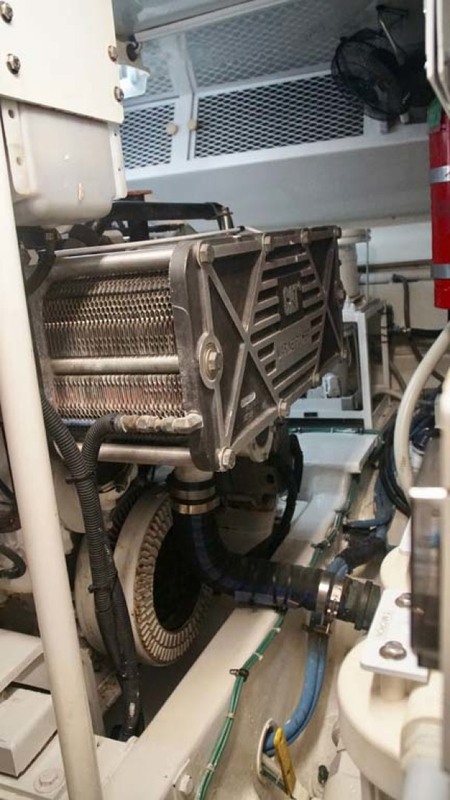 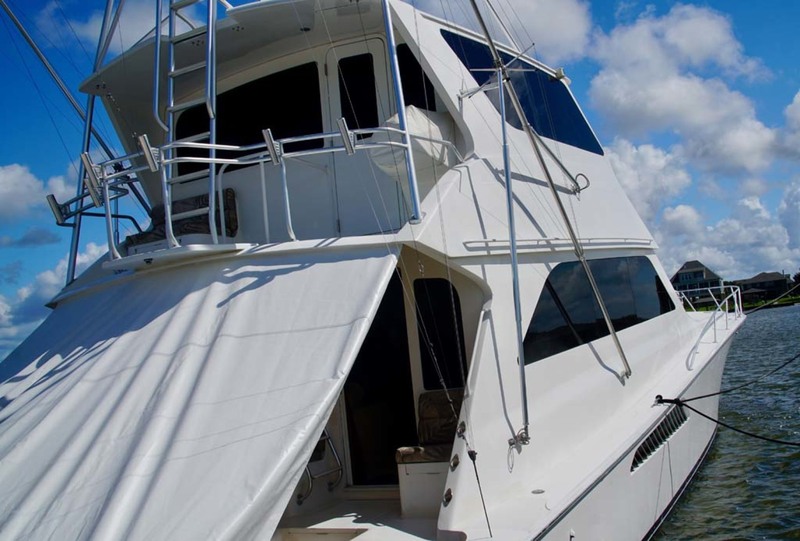 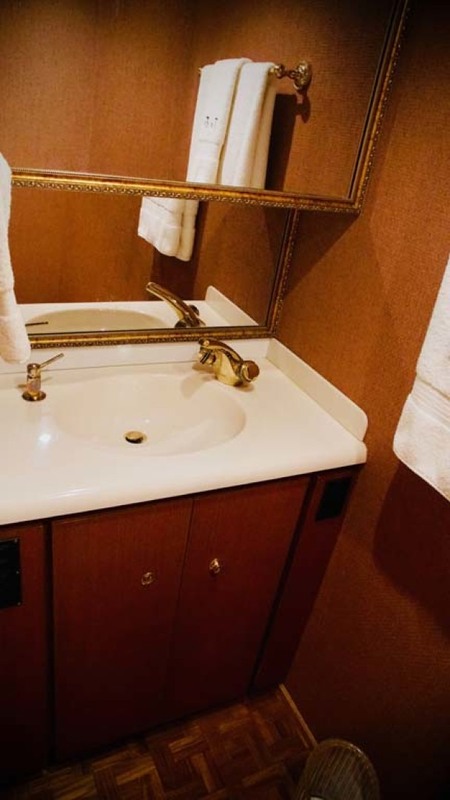 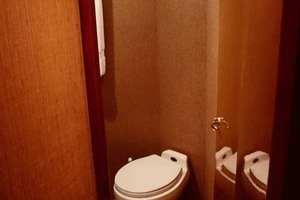 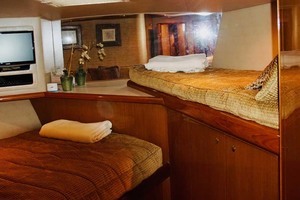 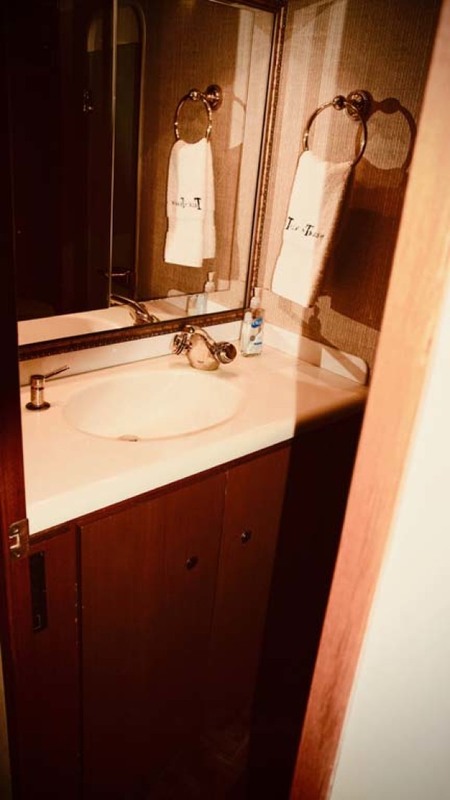 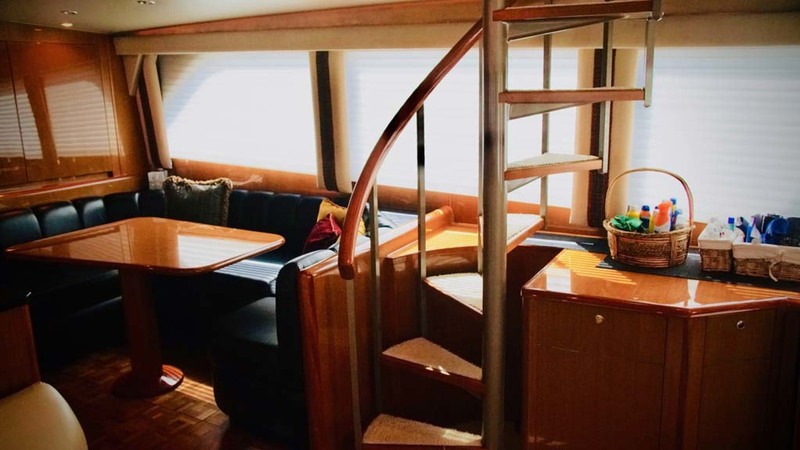 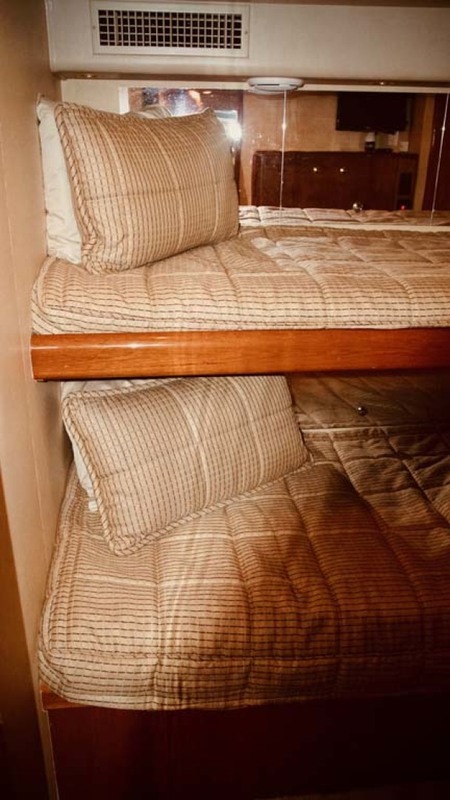 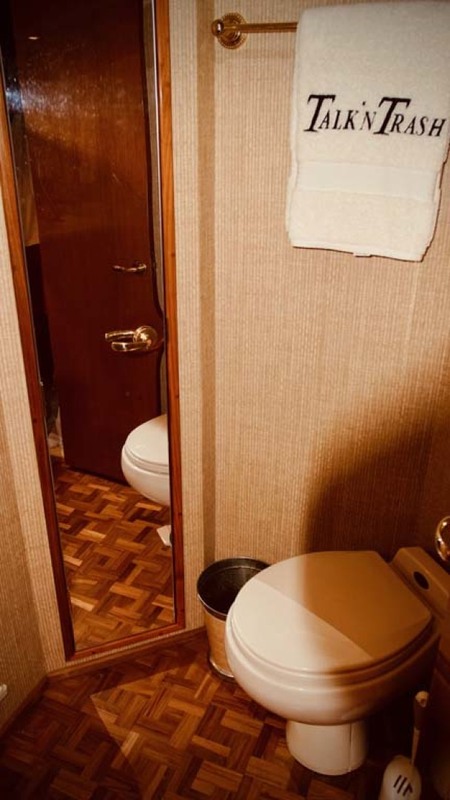 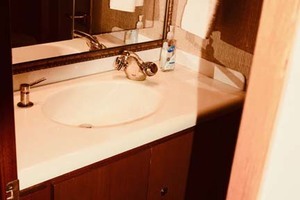 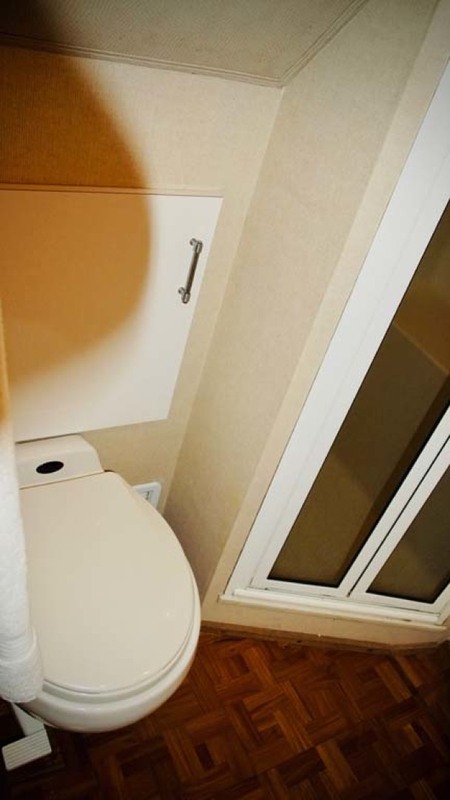 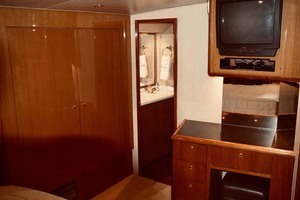 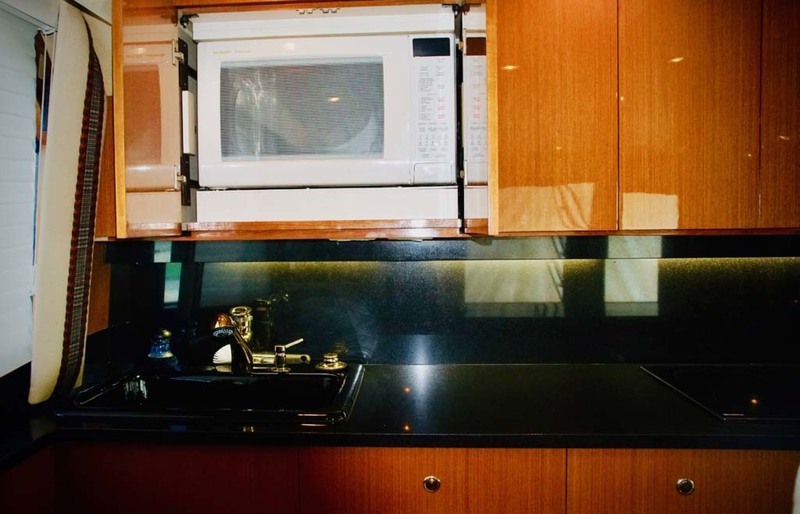 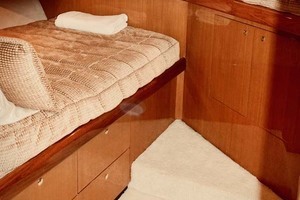 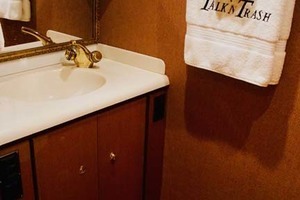 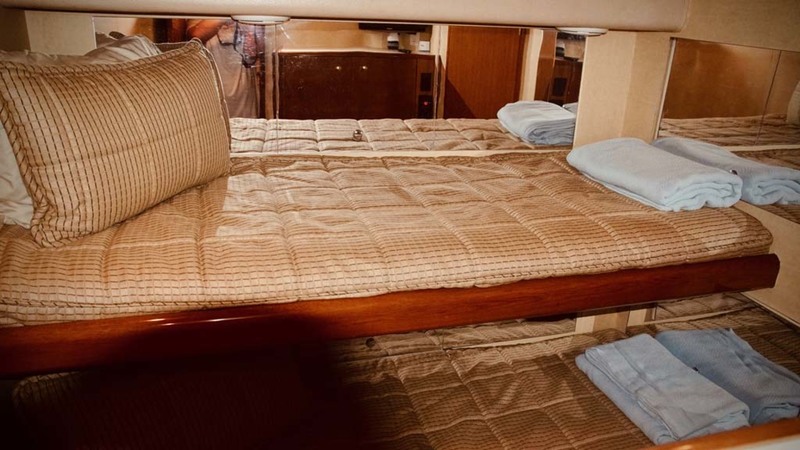 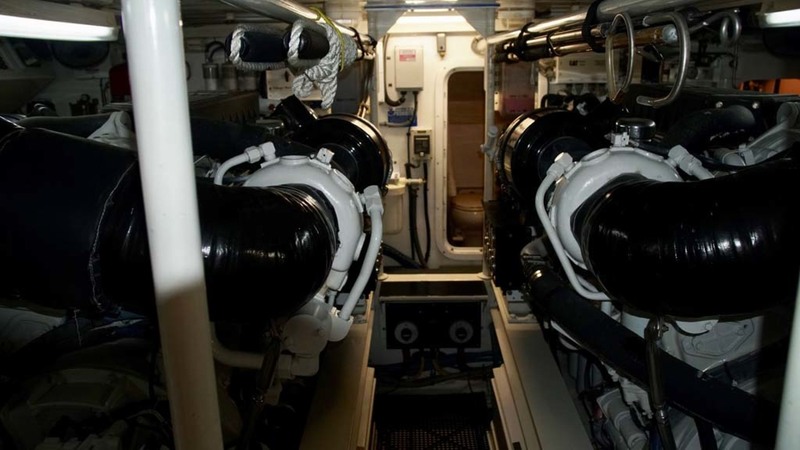 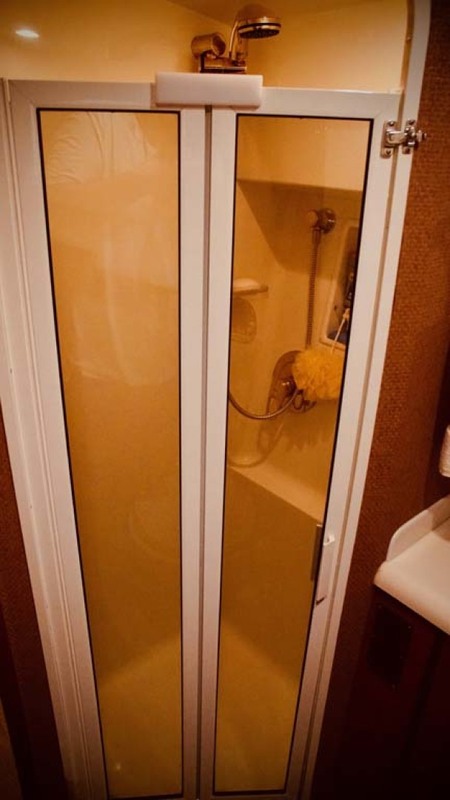 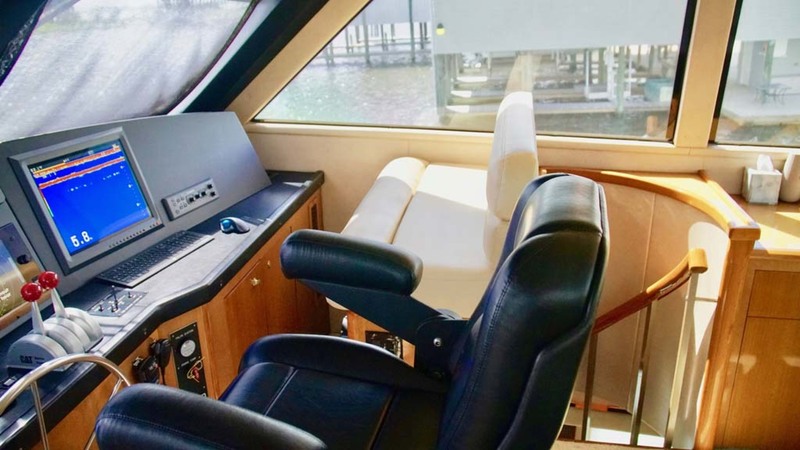 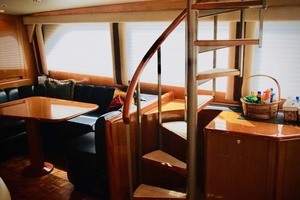 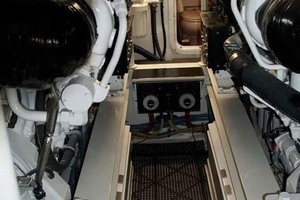 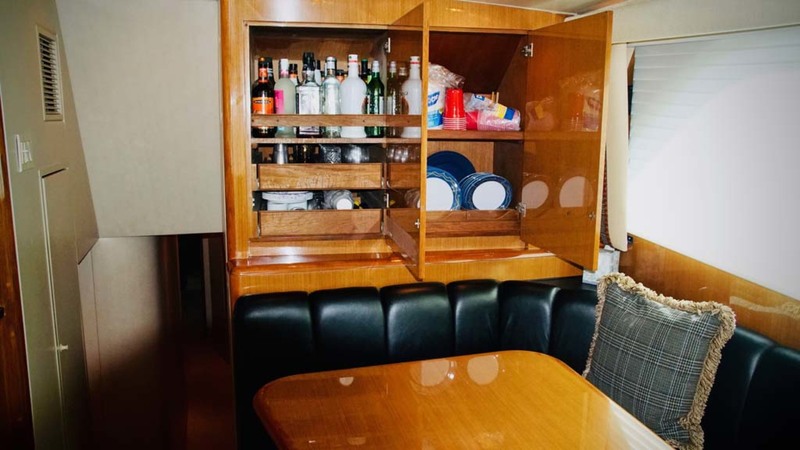 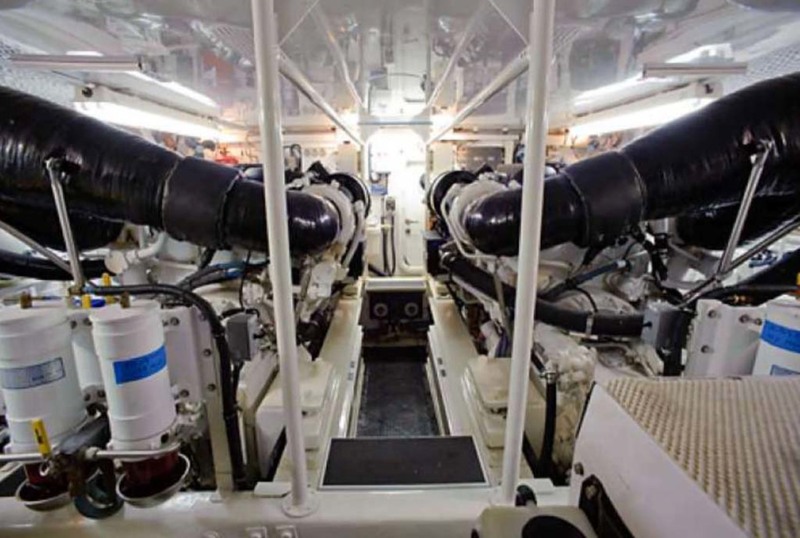 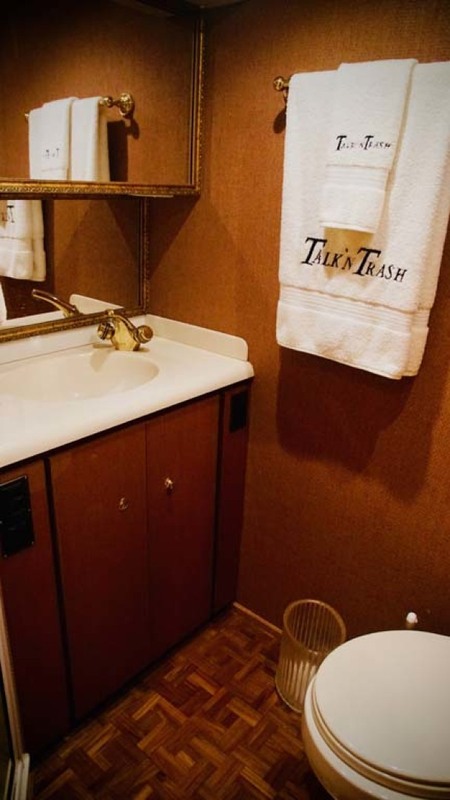 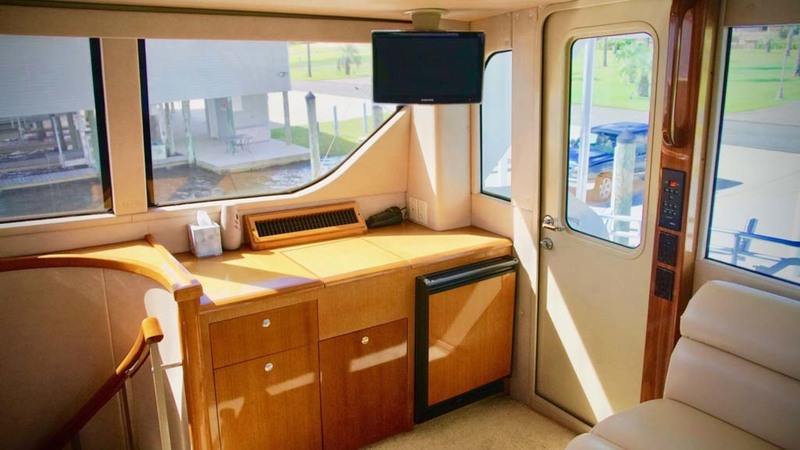 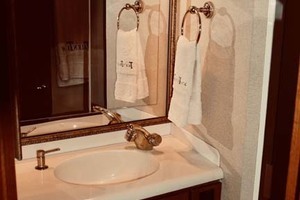 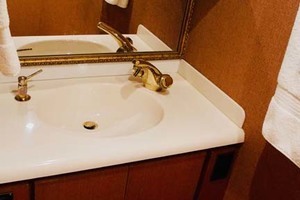 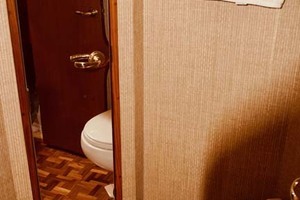 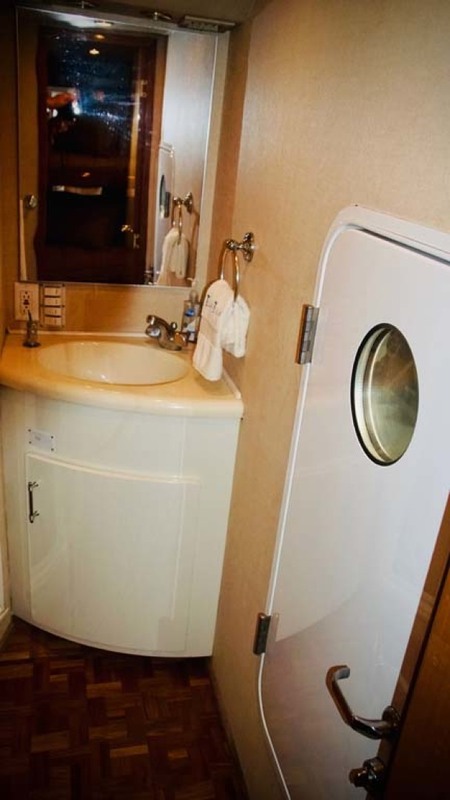 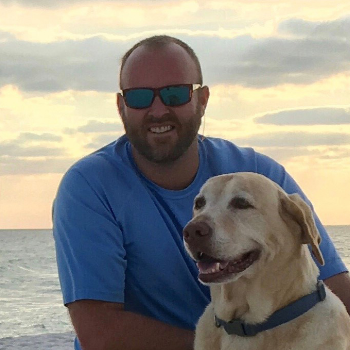 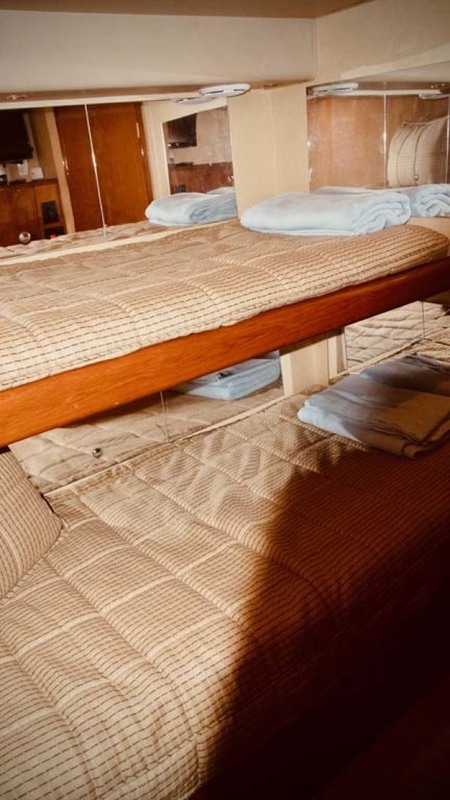 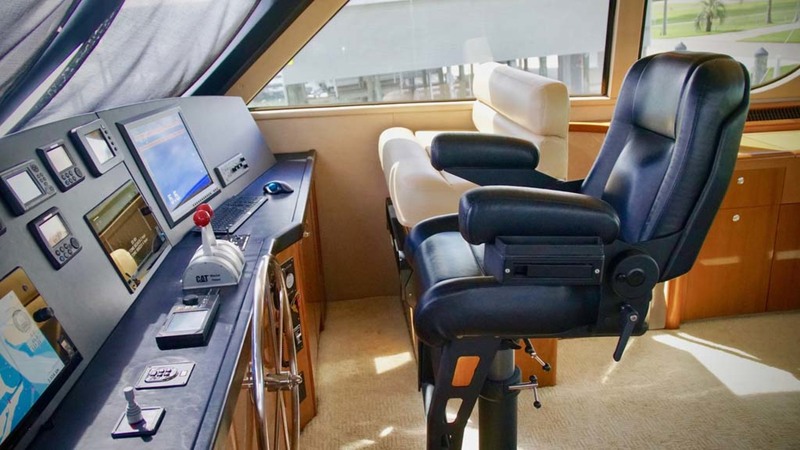 To port and aft, down two steps are the crew quarters, with private head and shower, two (2) very generous upper and lower bunks with private access to the engine room. 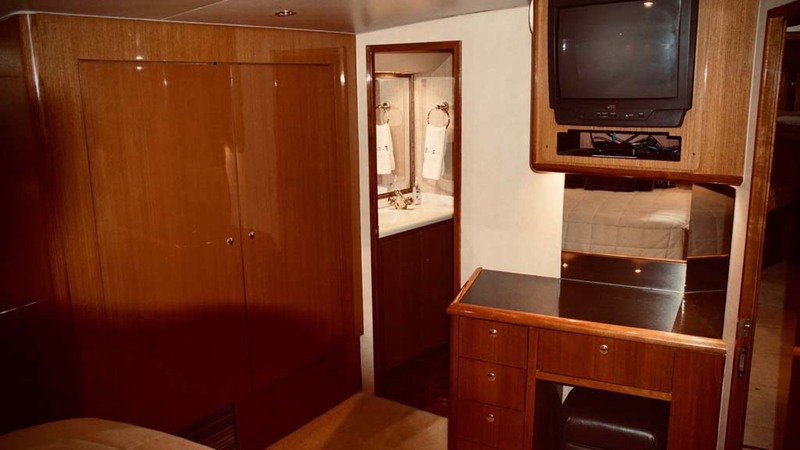 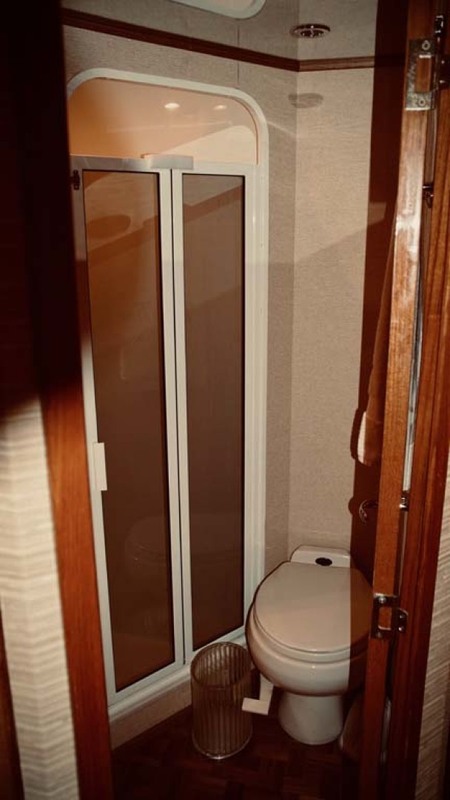 Moving forward to starboard is a luxurious guest head with mirrored cabinets, custom wallpaper, teak parquet flooring and private shower. 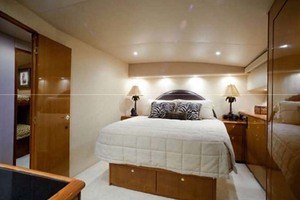 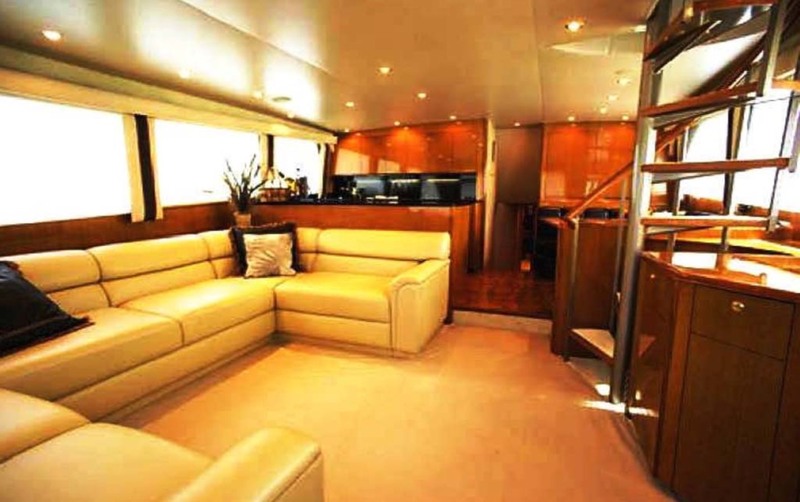 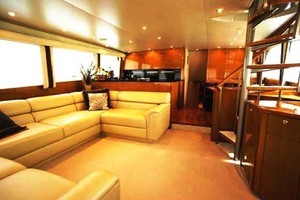 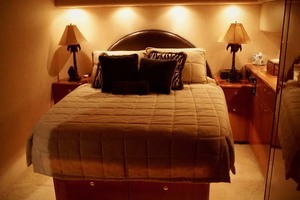 Just forward of the head to port, is the master suite. 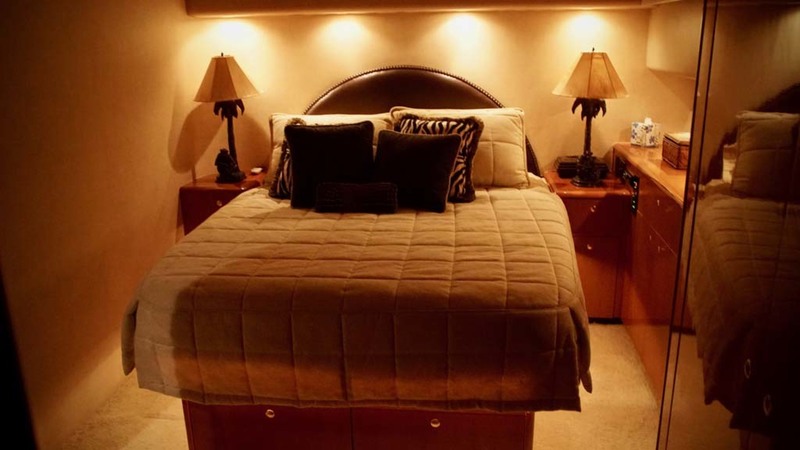 This large master suite offers an almost-king size bed which lifts up offering ample storage below has a soft feel with beautiful cabinetry accented by custom wallpaper, an elegant spread, and indirect lighting. 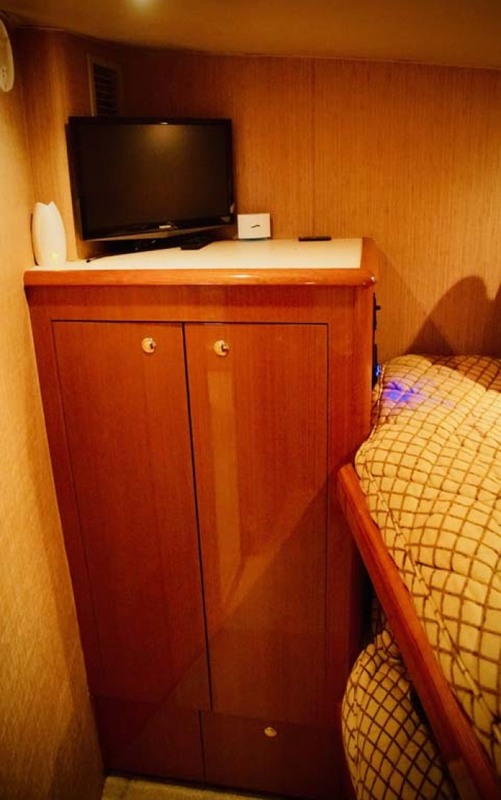 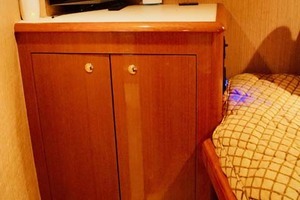 A guest stateroom with bunk arrangement, full hanging lockers, and storage below bottom lift up bunk is just forward of guest head. 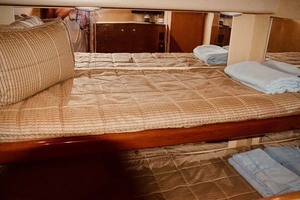 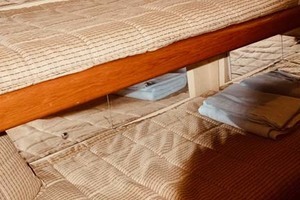 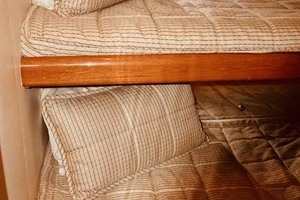 The spacious forward stateroom or VIP is arranged with a large double bed to port with a starboard upper bunk. 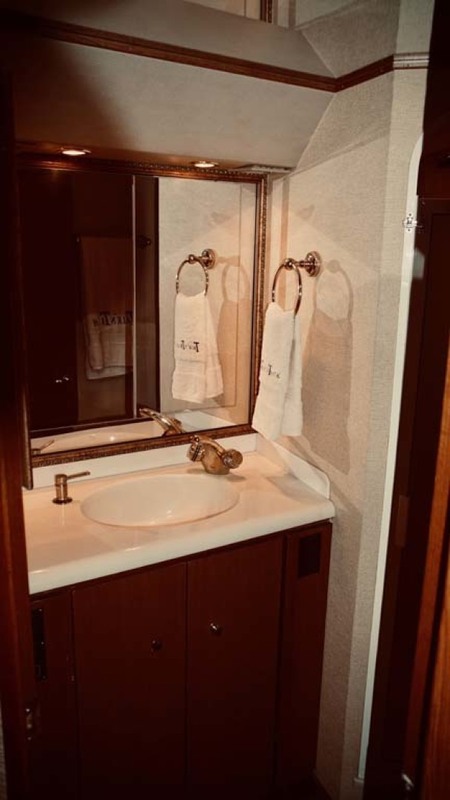 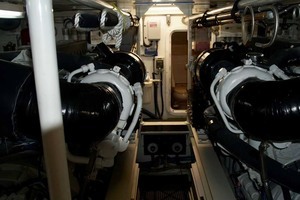 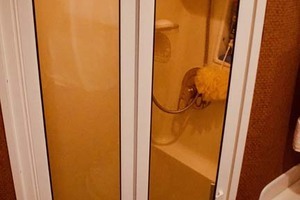 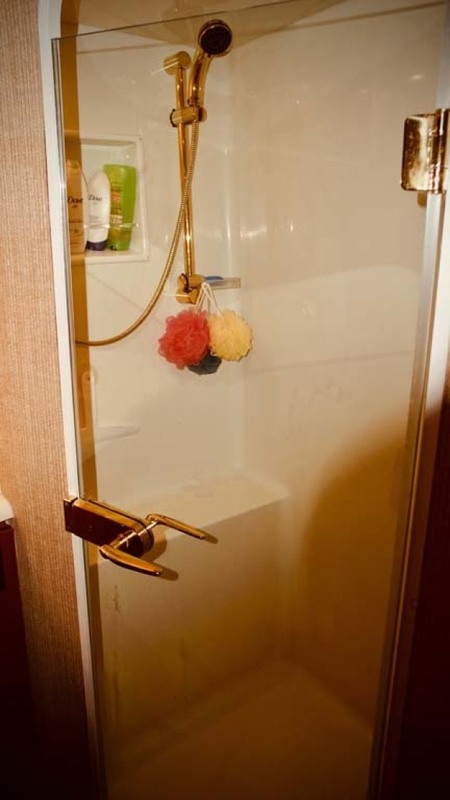 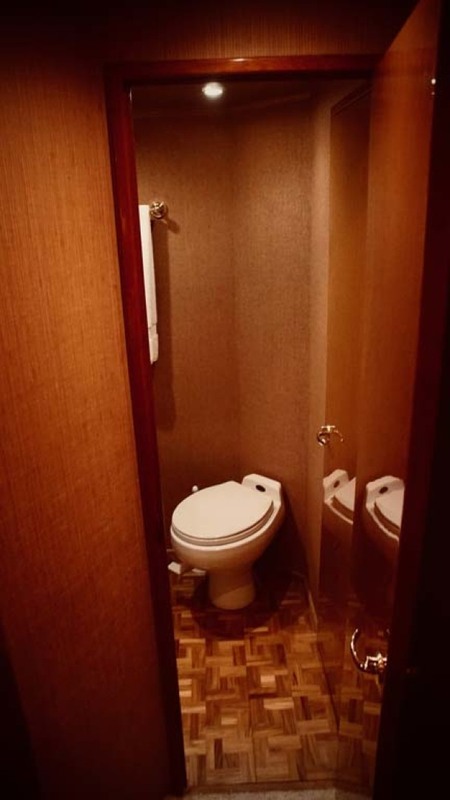 A private head and shower adjoin this room to starboard. 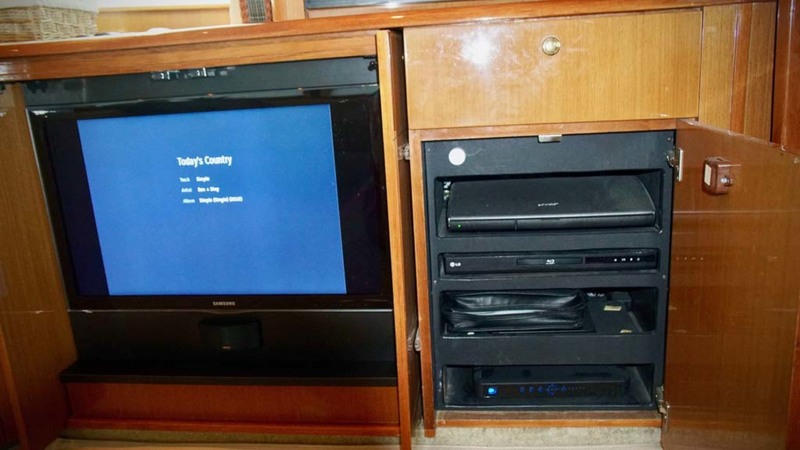 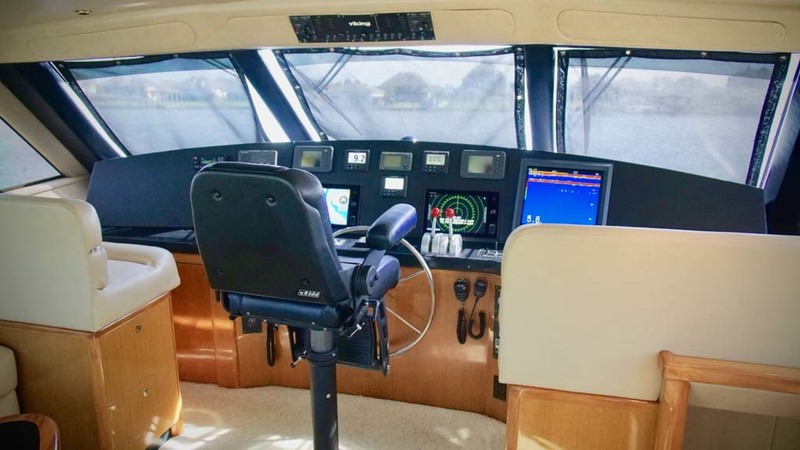 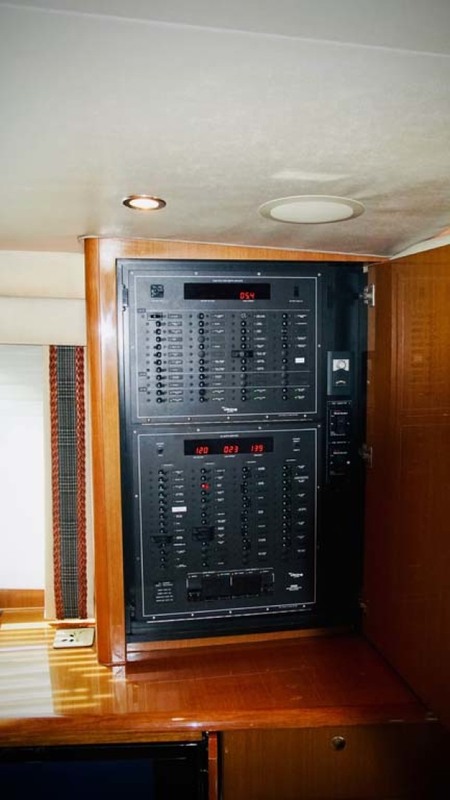 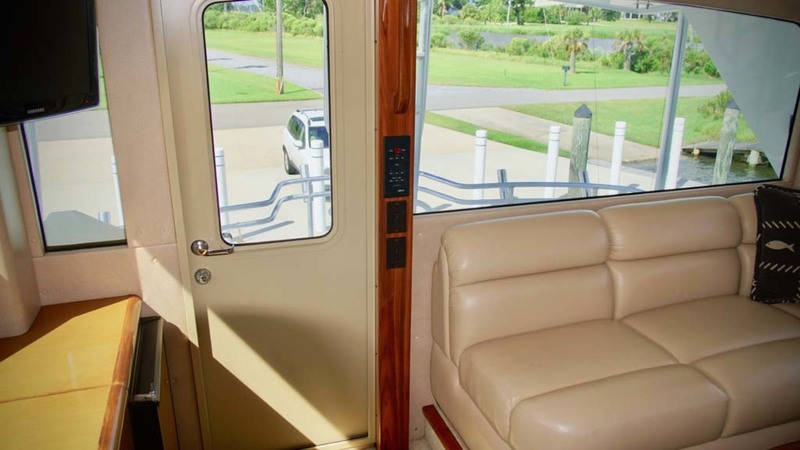 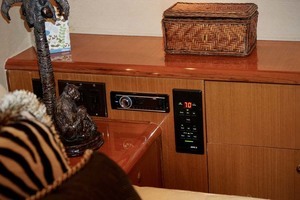 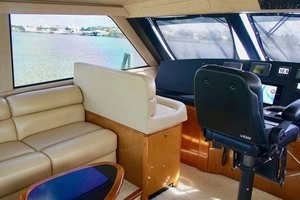 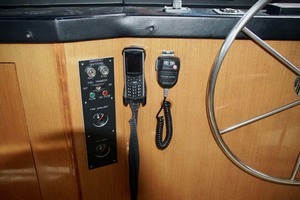 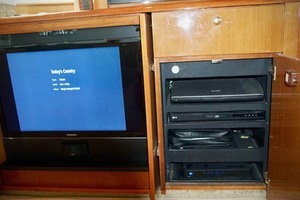 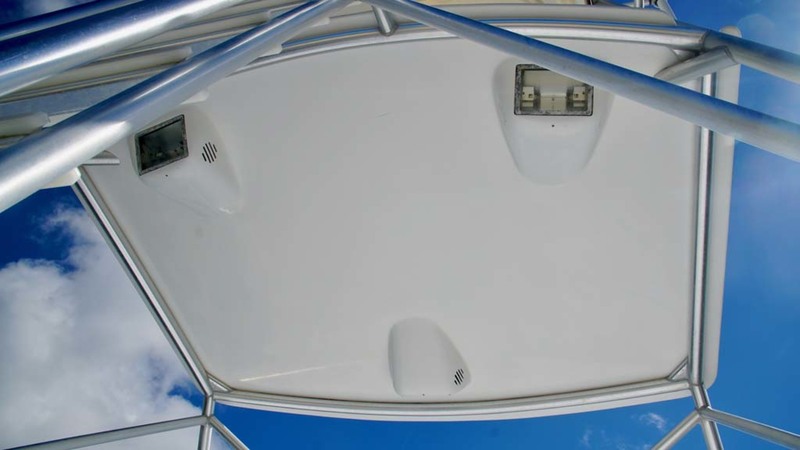 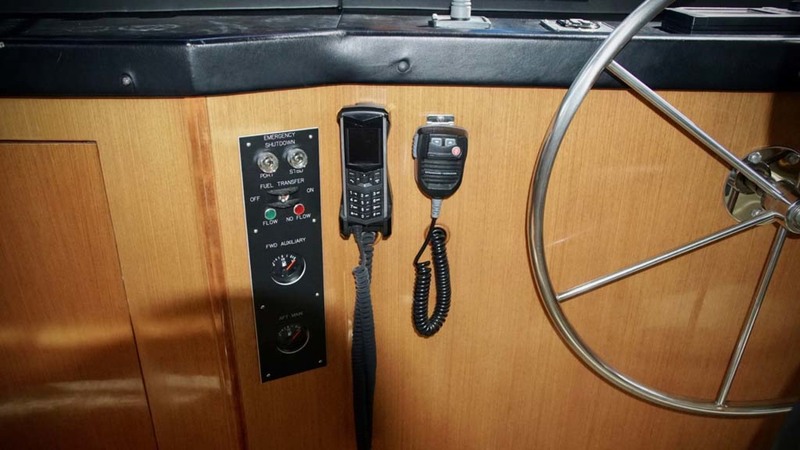 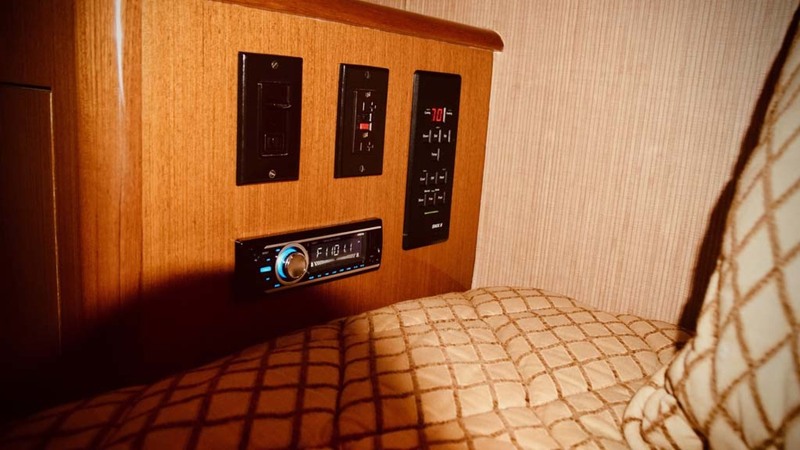 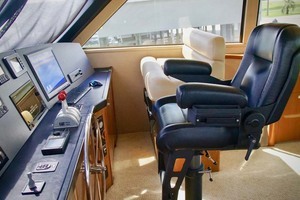 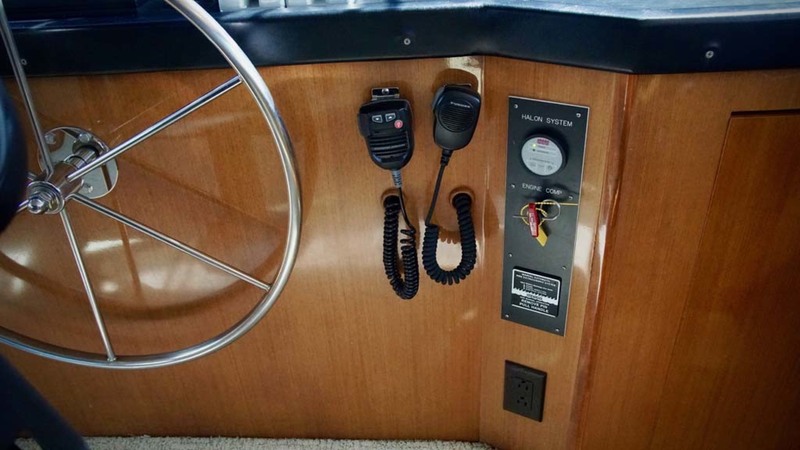 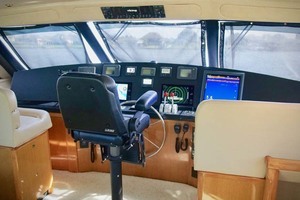 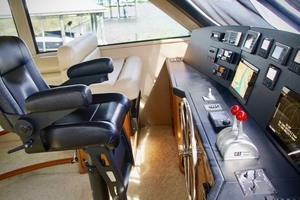 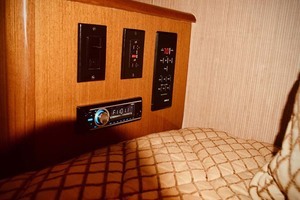 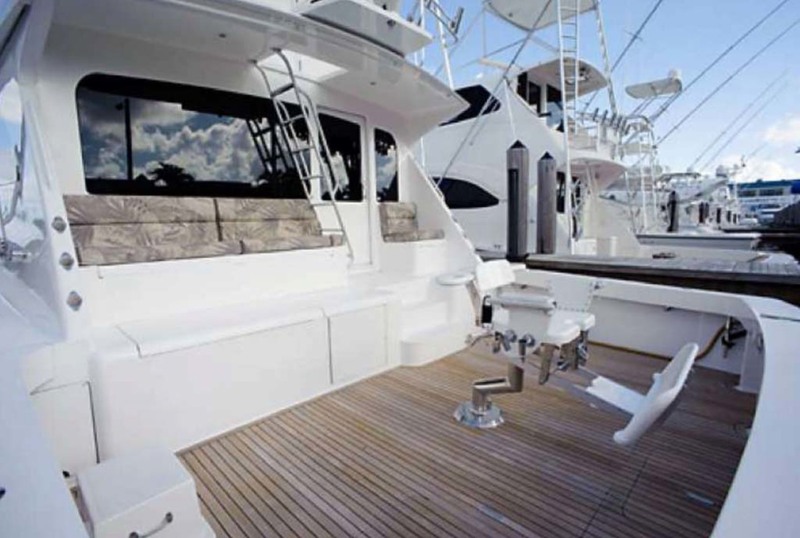 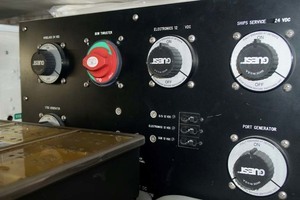 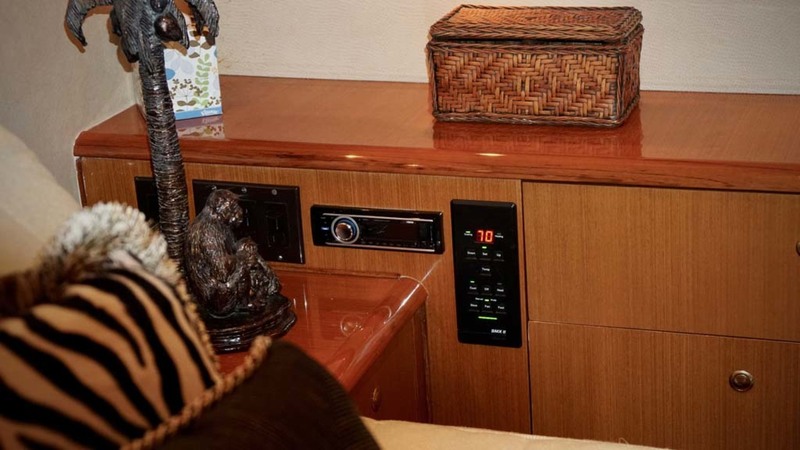 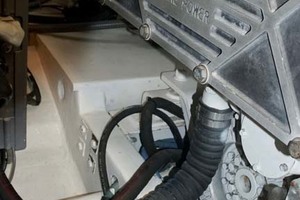 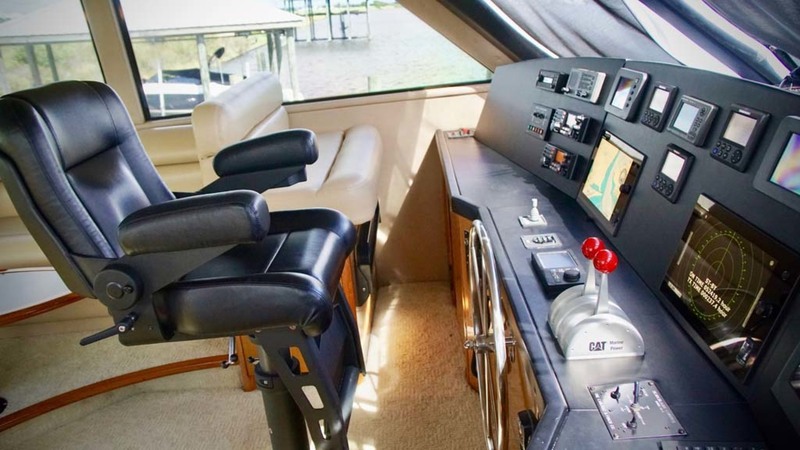 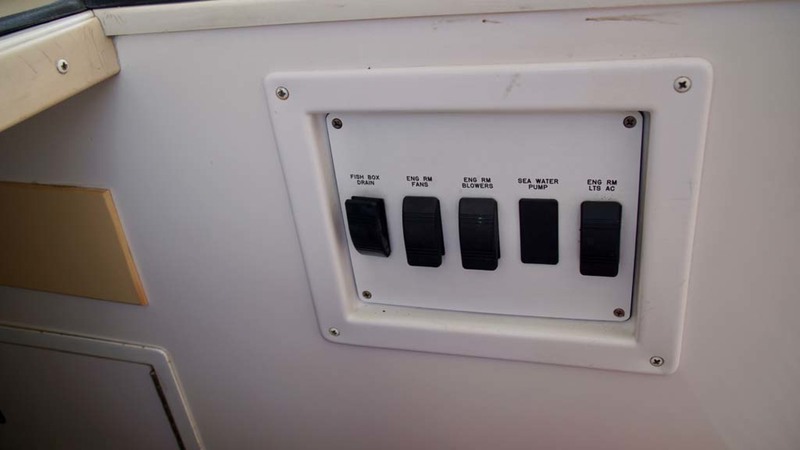 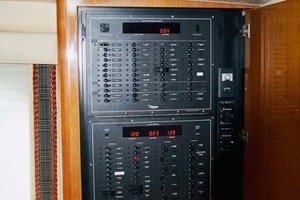 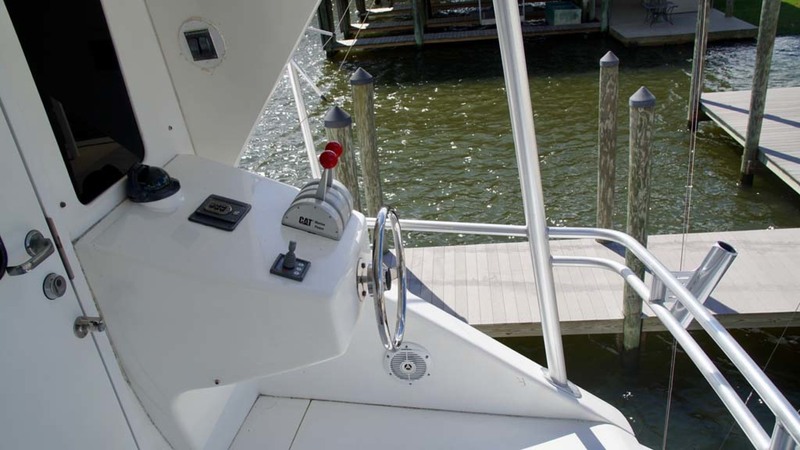 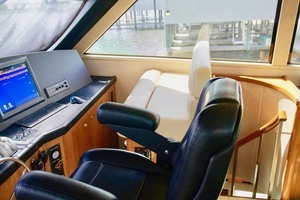 The flybridge (FB) speakers are wired to the cockpit with a separate switch in salon to play salon stereo through cockpit speakers, or FB stereo through cockpit speakers. 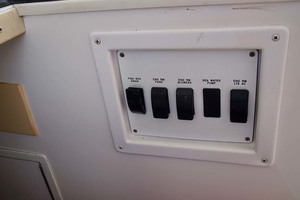 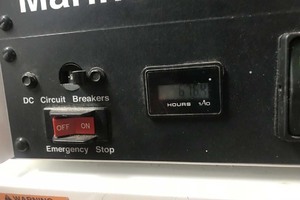 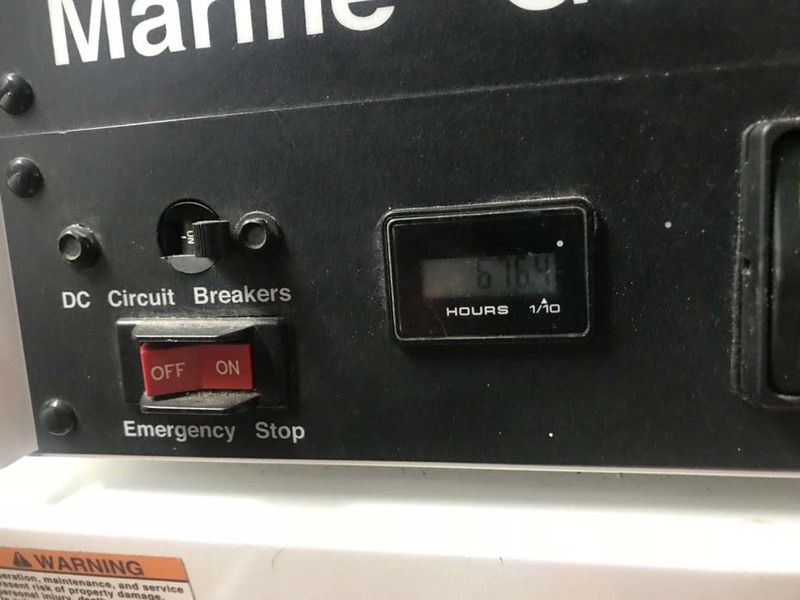 There is a separate volume control in salon for cockpit speakers. 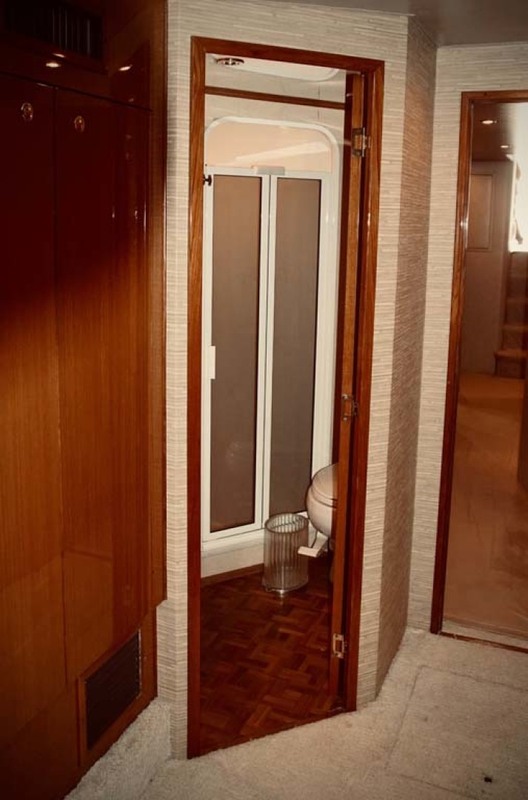 Private head access. 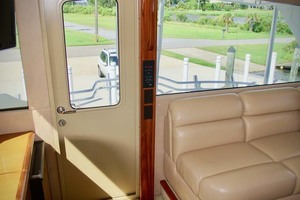 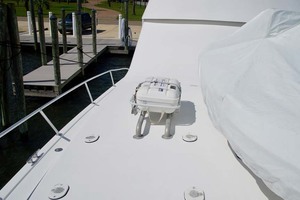 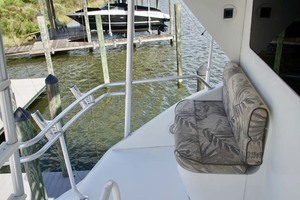 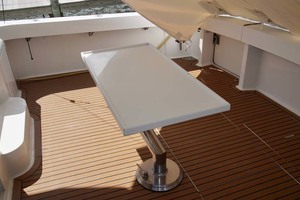 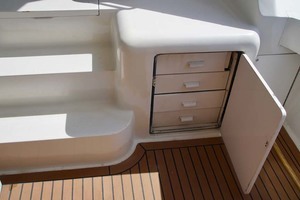 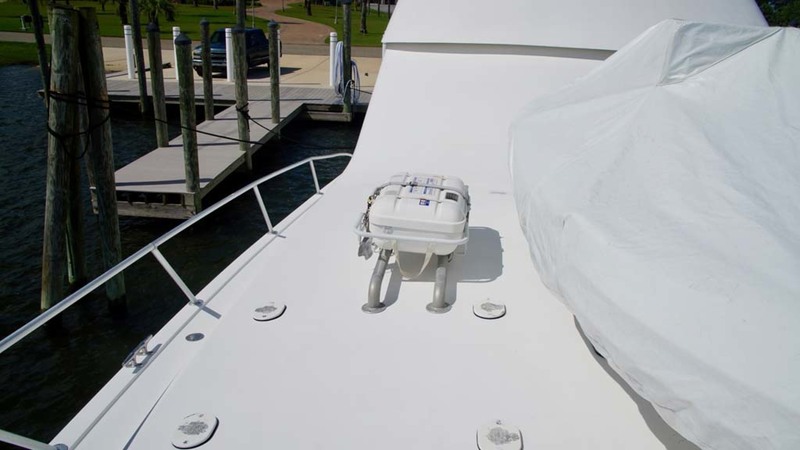 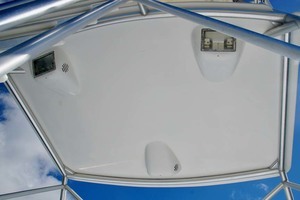 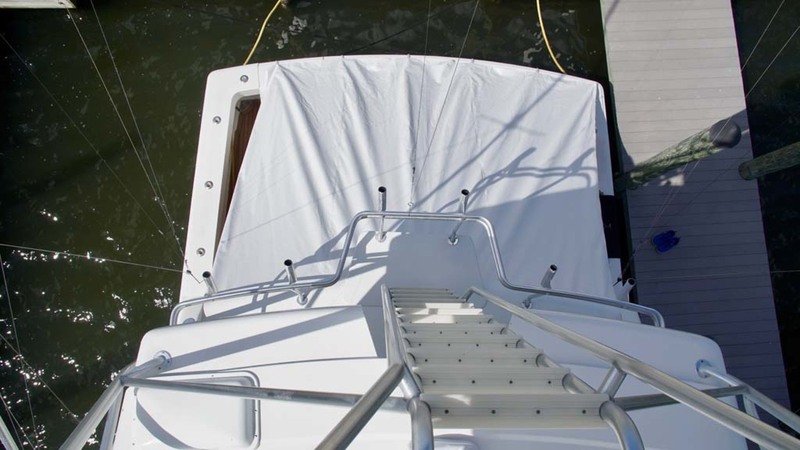 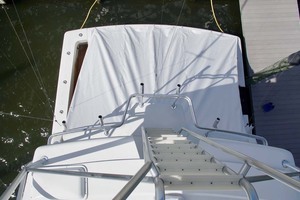 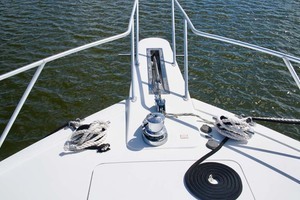 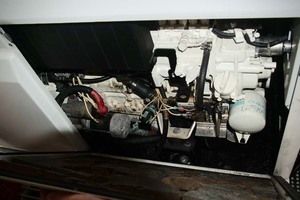 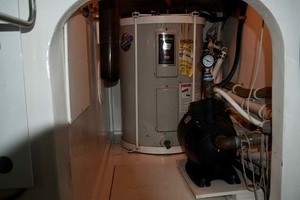 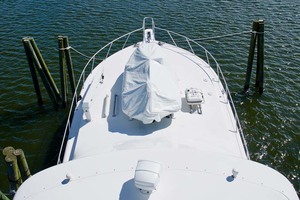 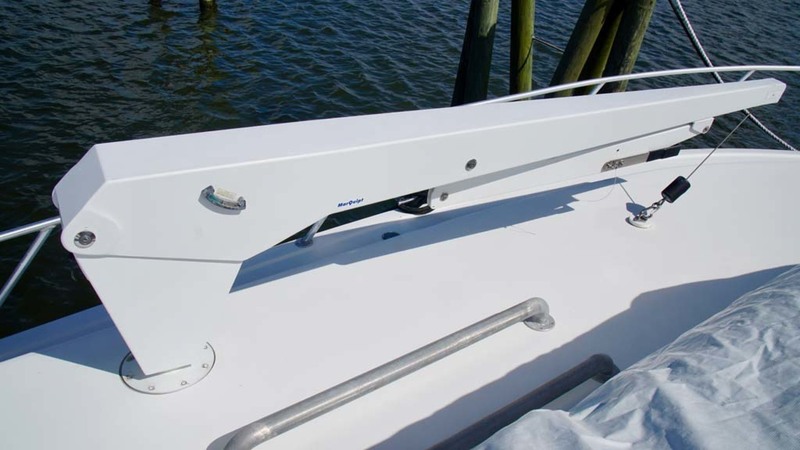 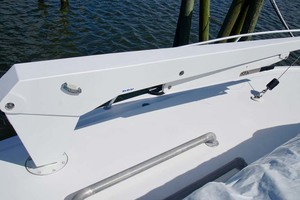 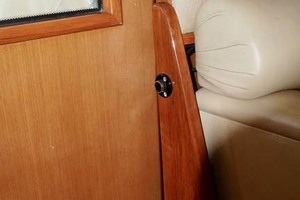 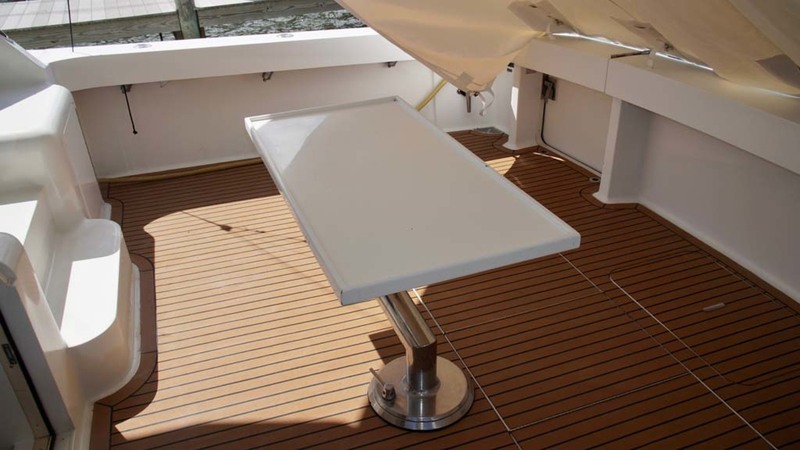 Head can also be accessed through companionway. 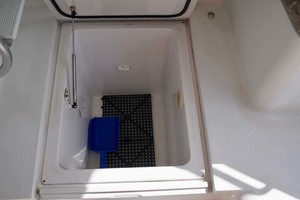 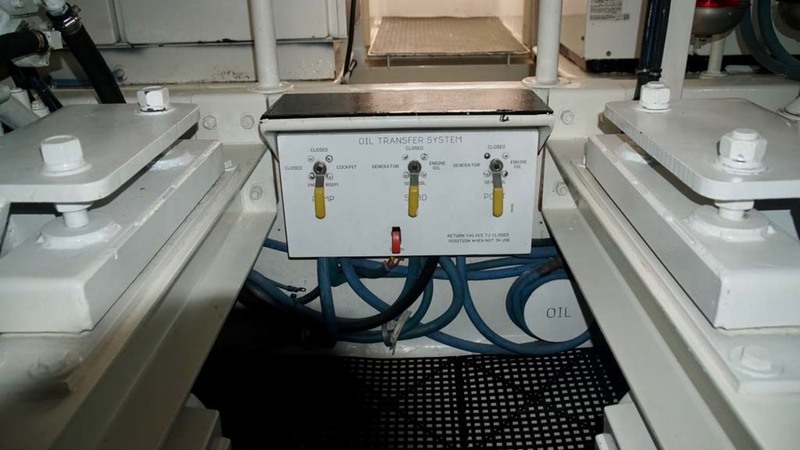 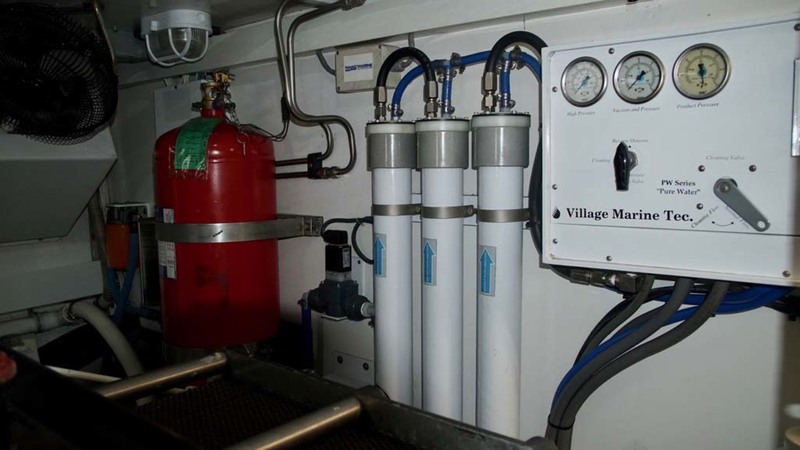 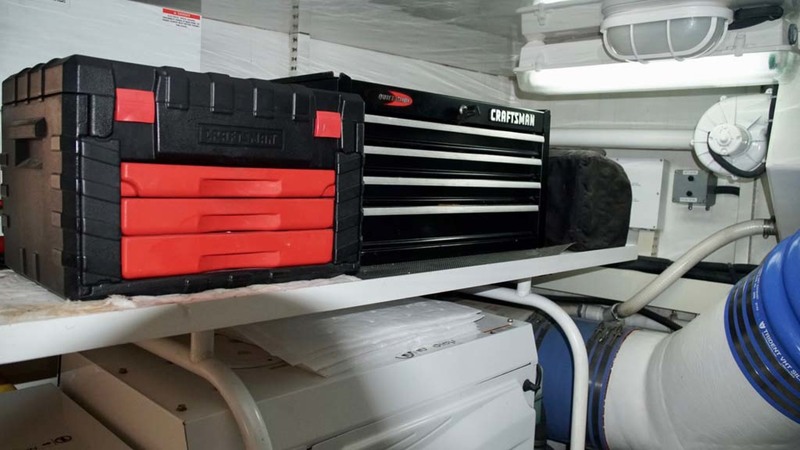 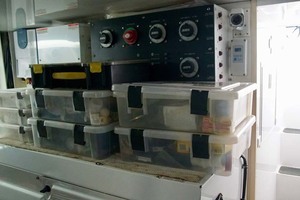 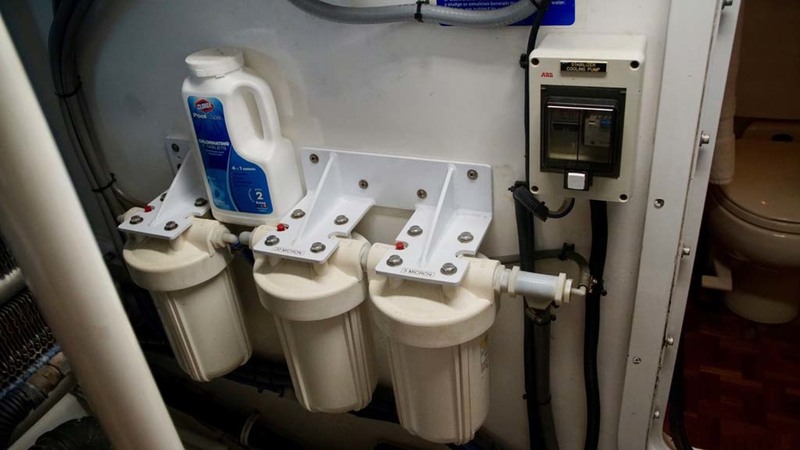 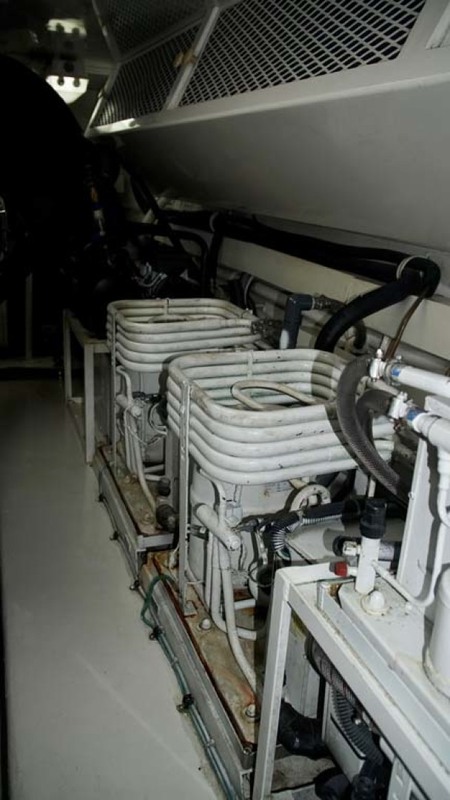 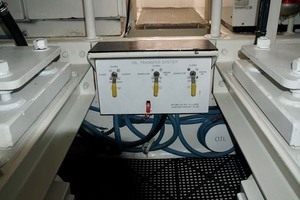 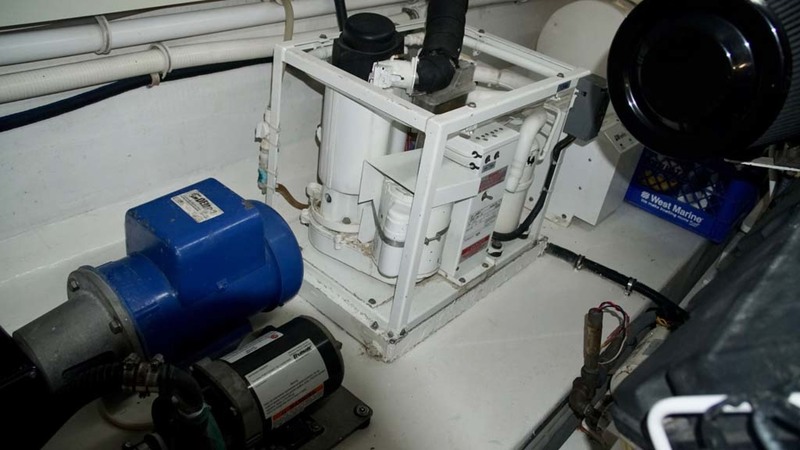 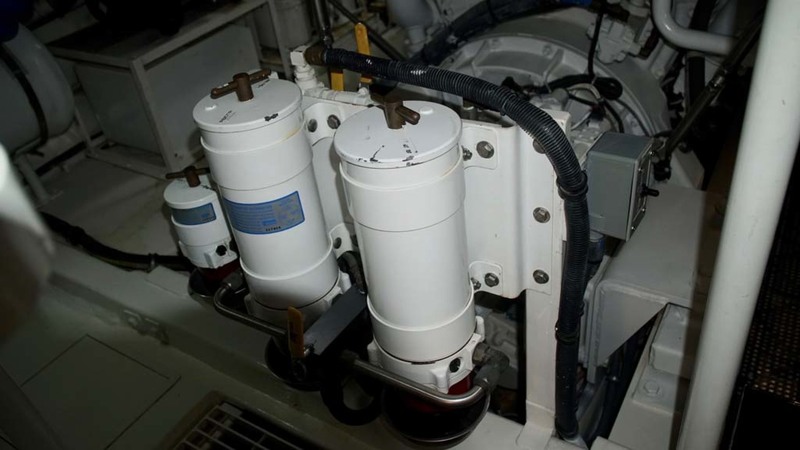 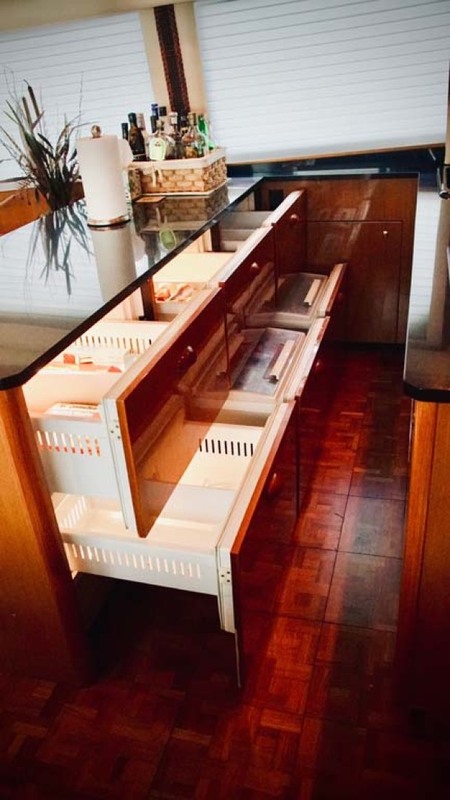 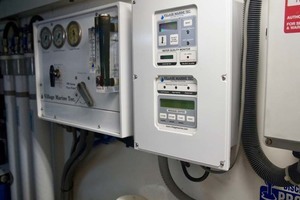 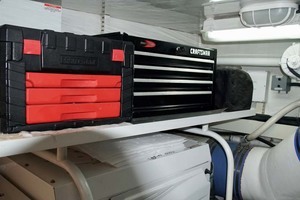 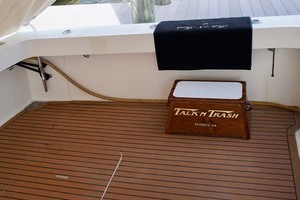 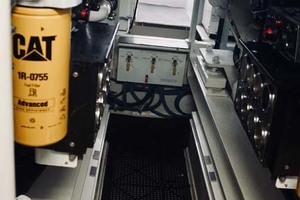 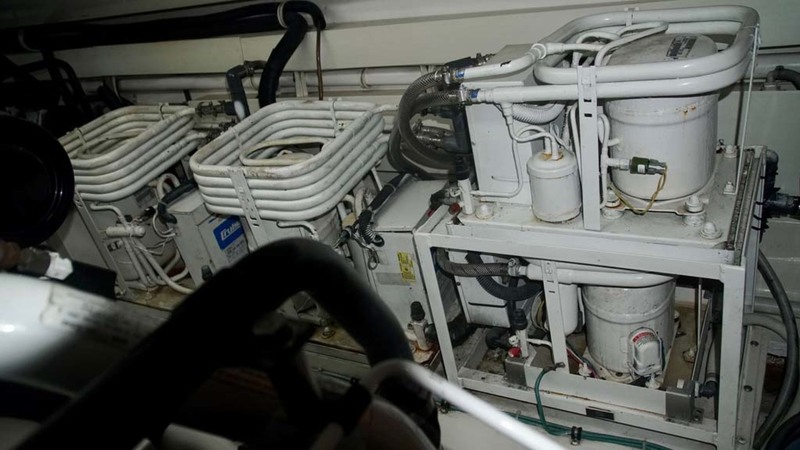 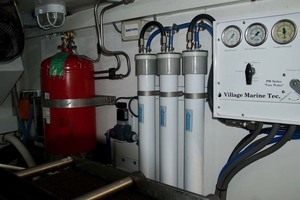 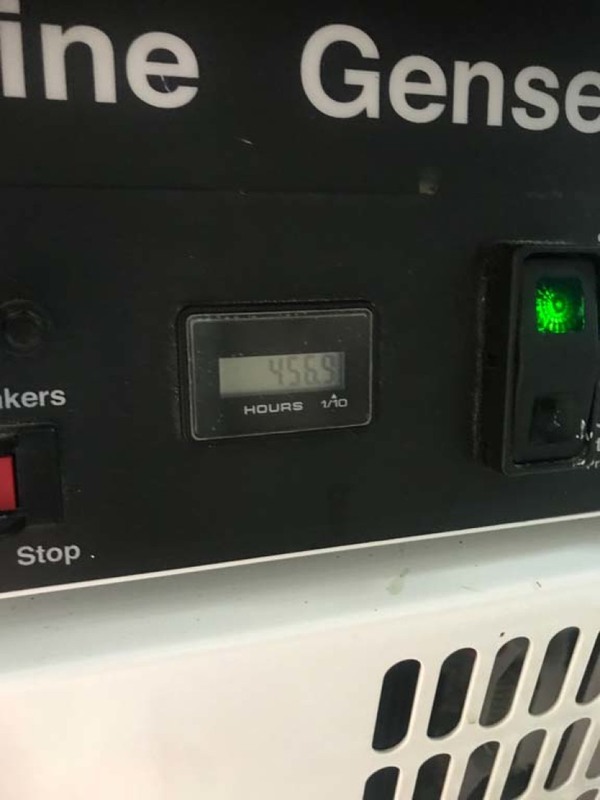 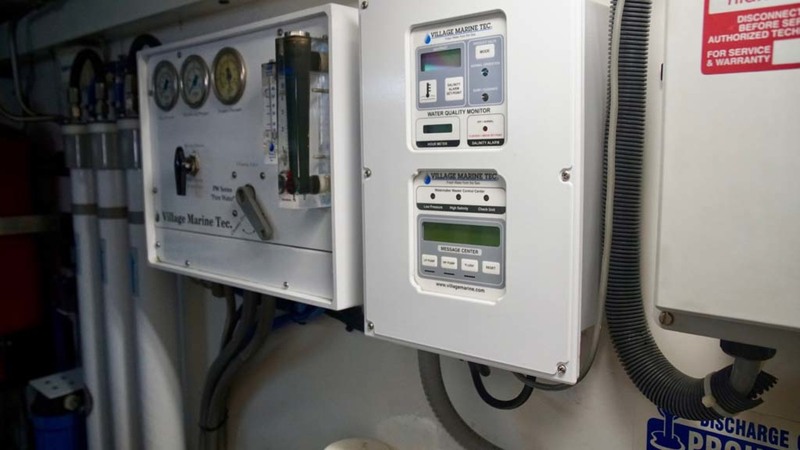 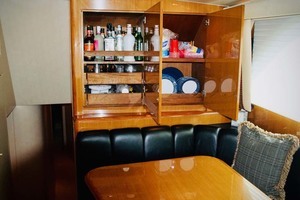 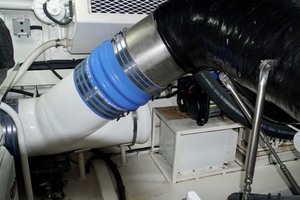 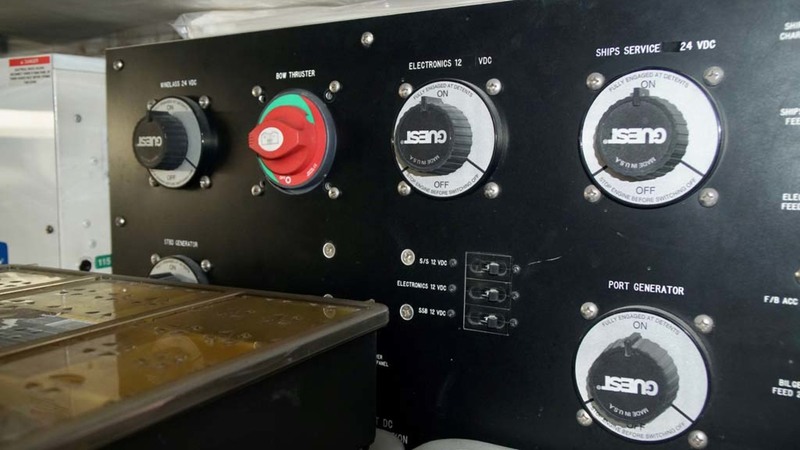 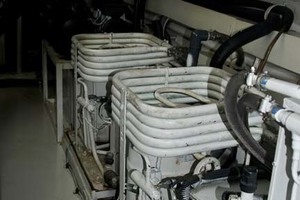 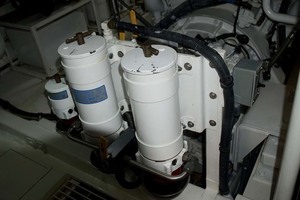 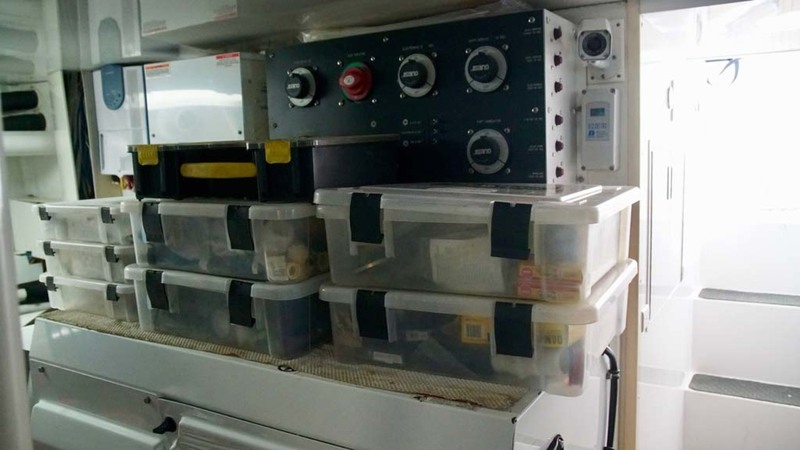 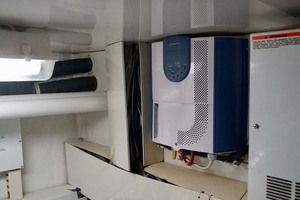 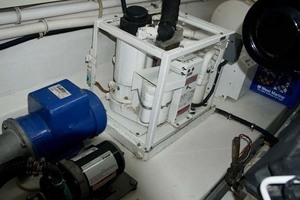 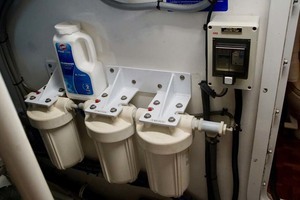 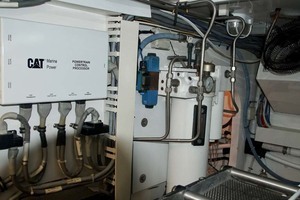 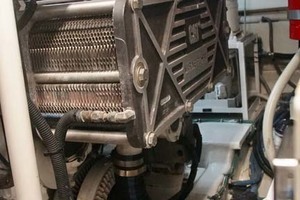 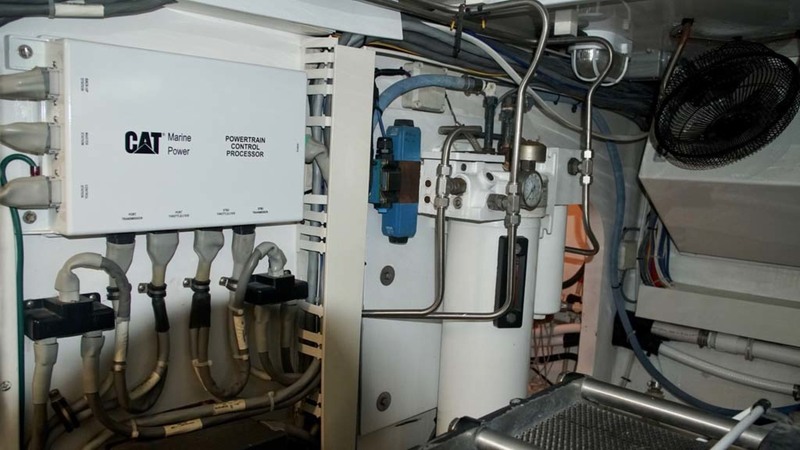 This vessel was built with the cockpit mezzanine option, allowing for more storage for brushes, mops, cleaning gear, life raft, life jackets, lager freezer capabilities, crushed ice, and refrigerated step box.